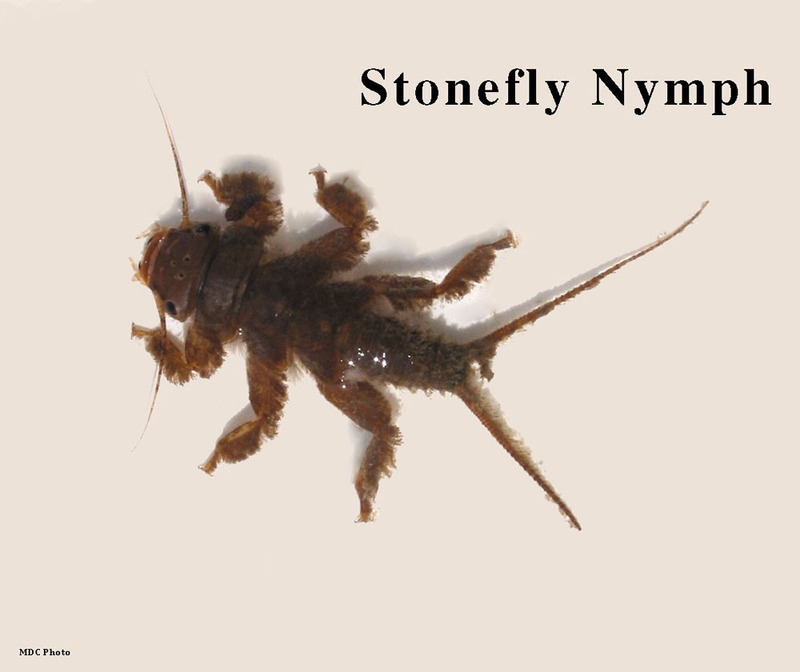 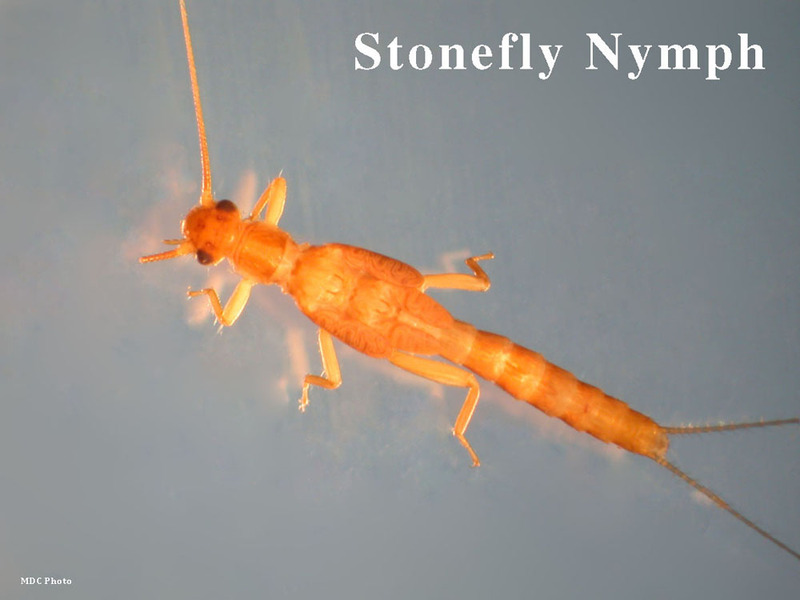 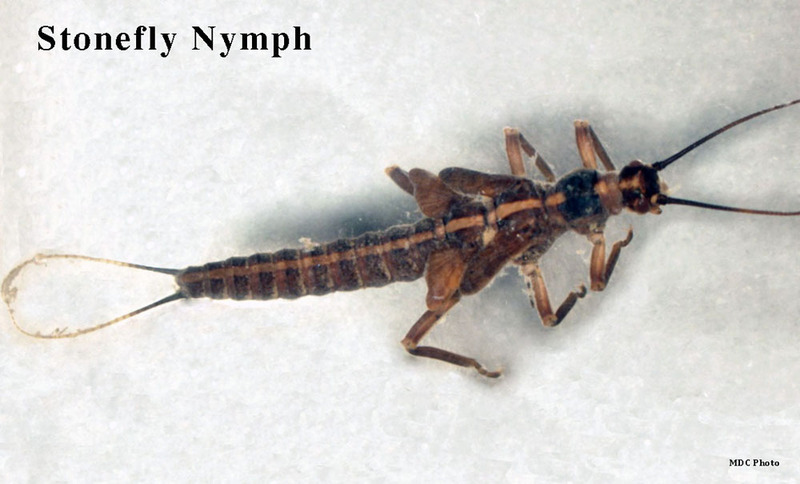 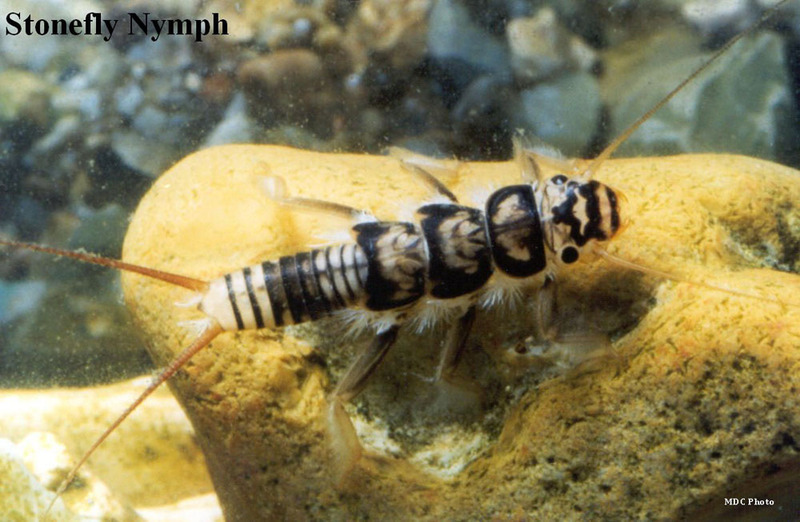 Stonefly nymphs have no gills on the abdomen, sometimes have hairlike gills under the legs on the thorax (hairy armpits), two tails. 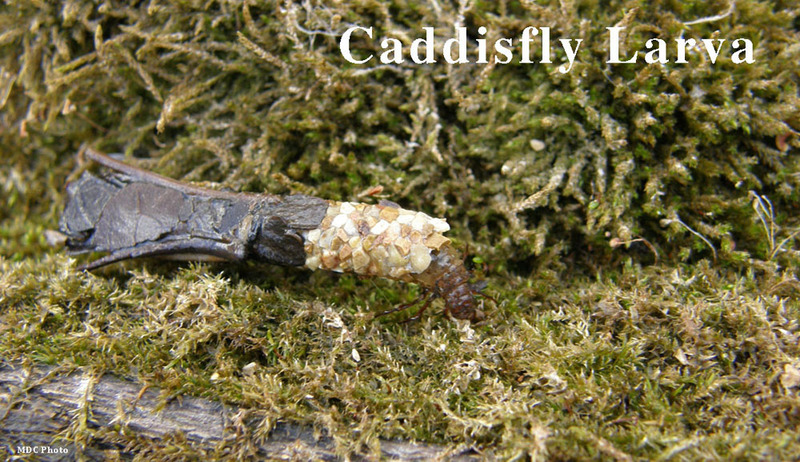 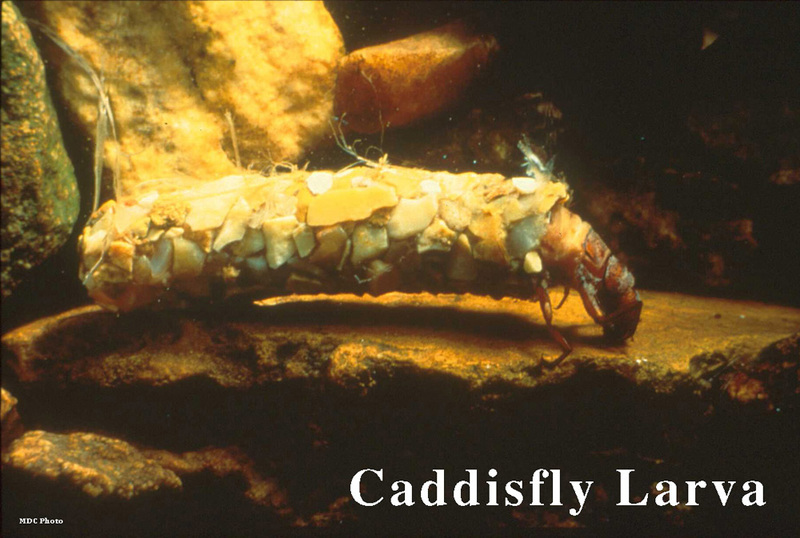 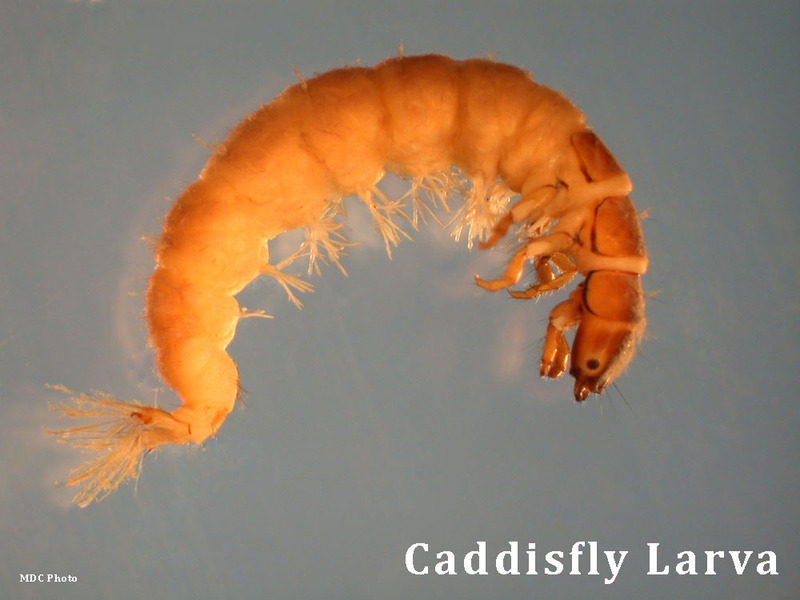 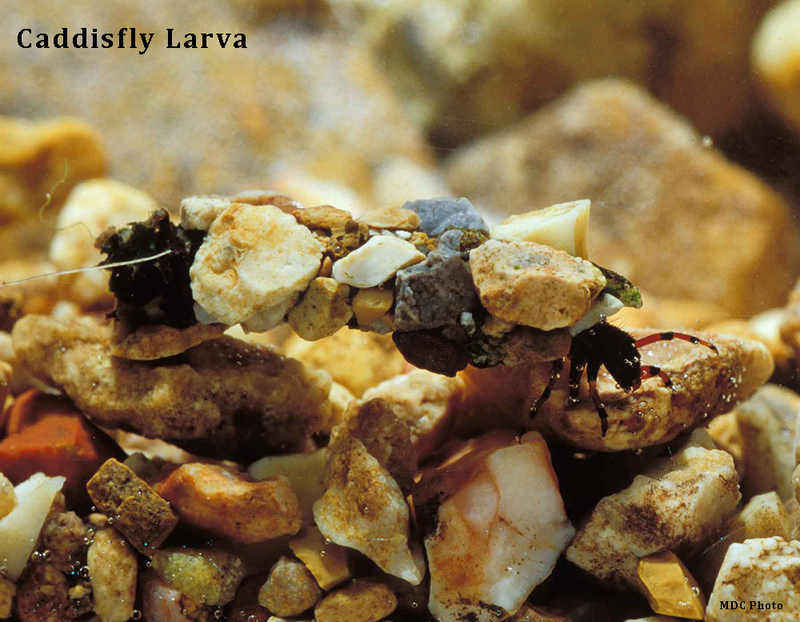 Caddisfly larvae have bodies longer than it is wide; distinct head, one to three hard plates on the thorax; abdomen ends in two terminal hooks and, unlike thorax has no hardened outer plates. 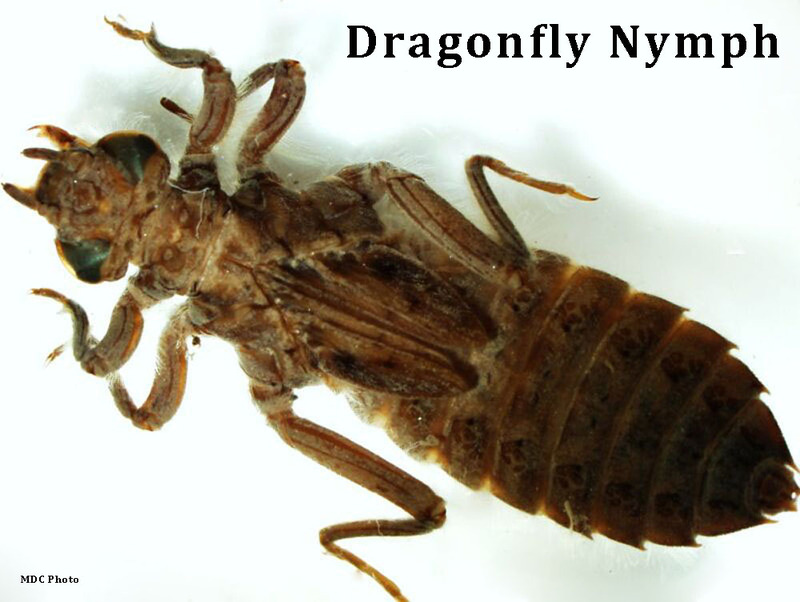 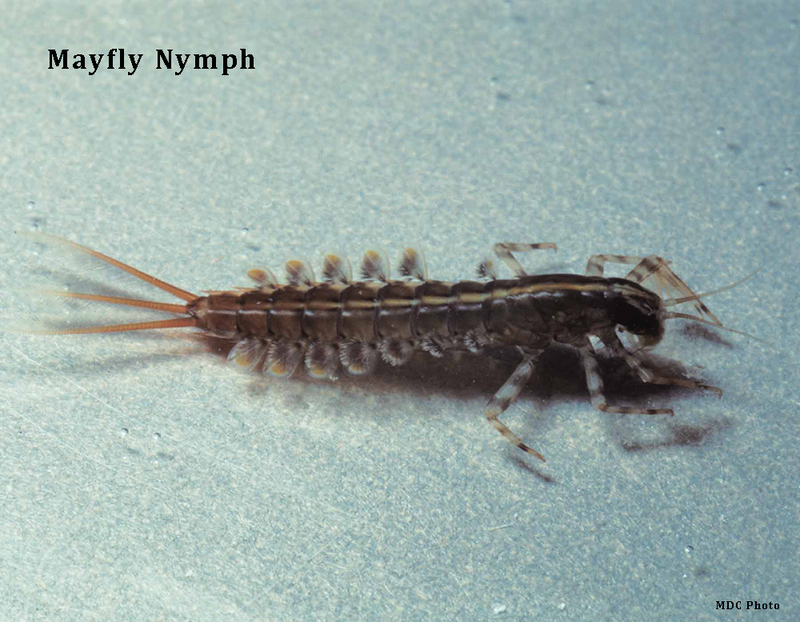 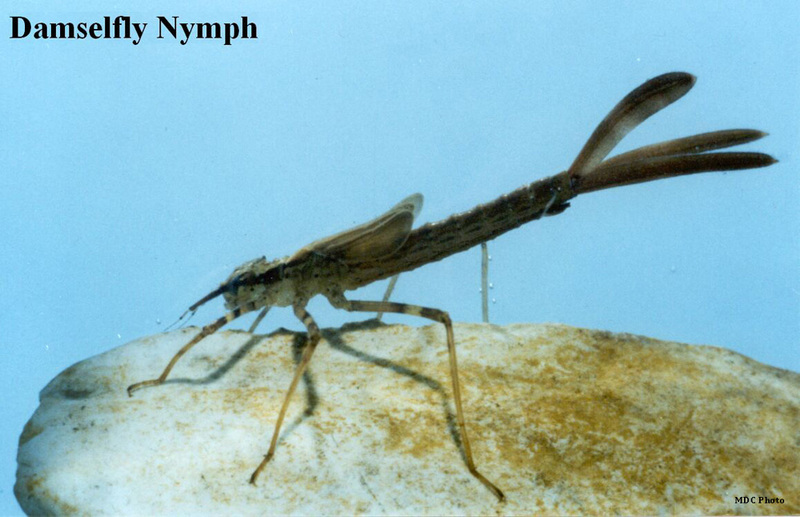 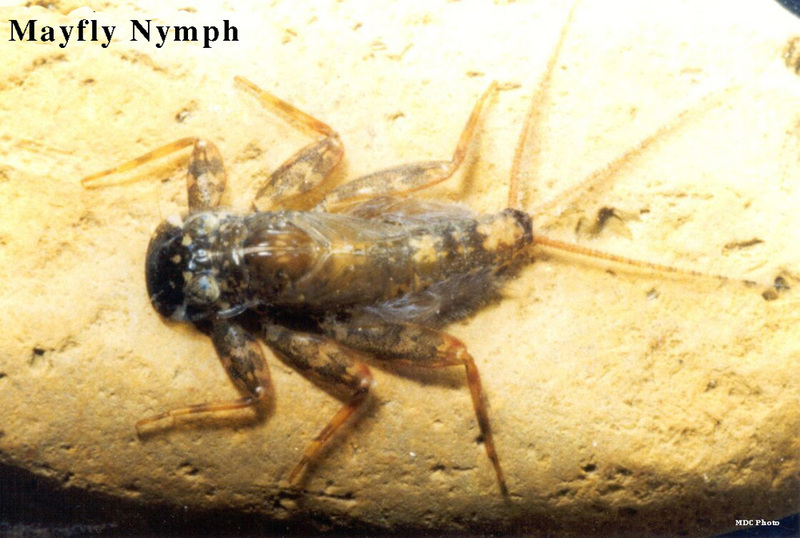 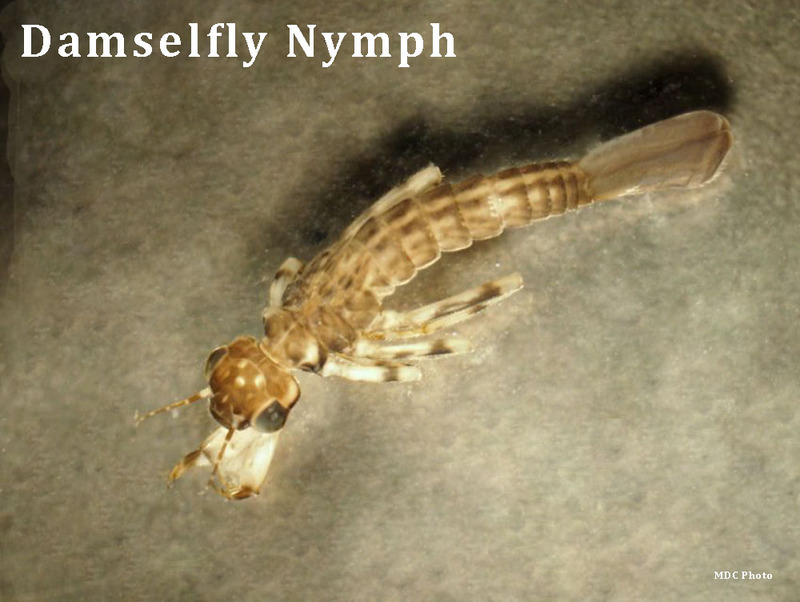 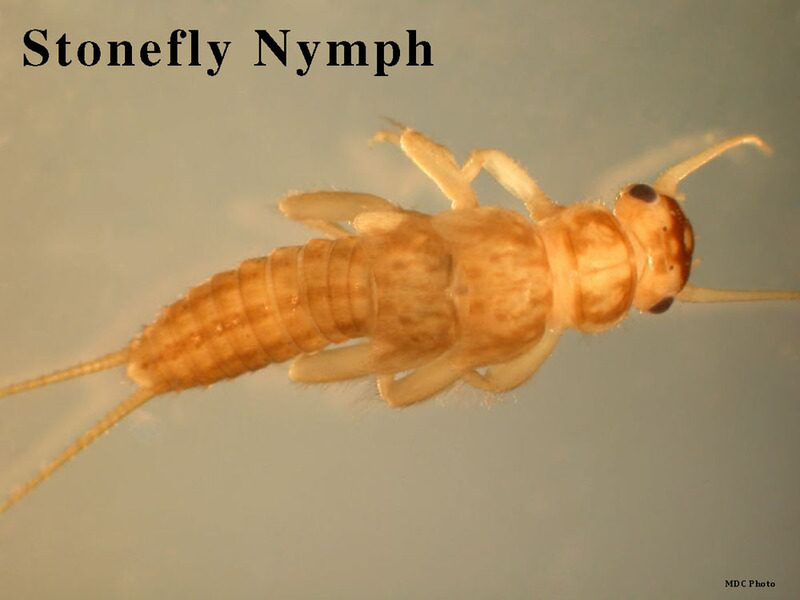 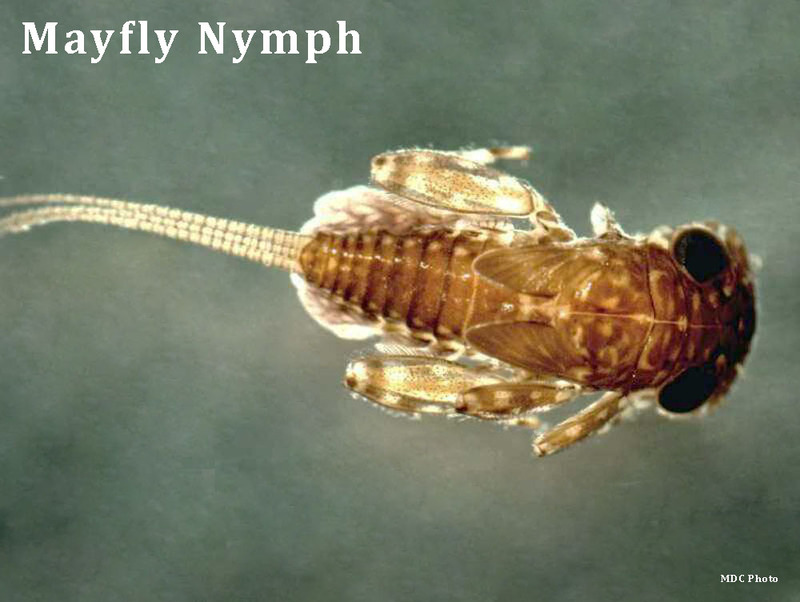 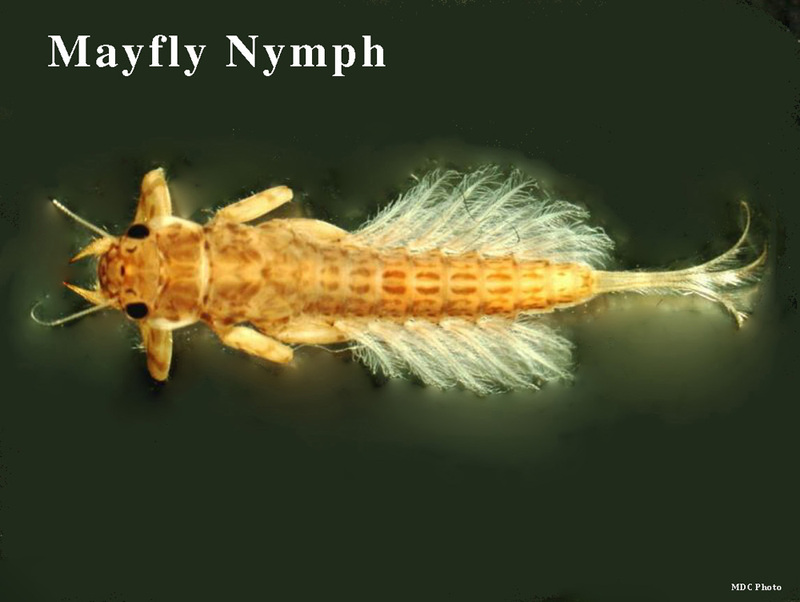 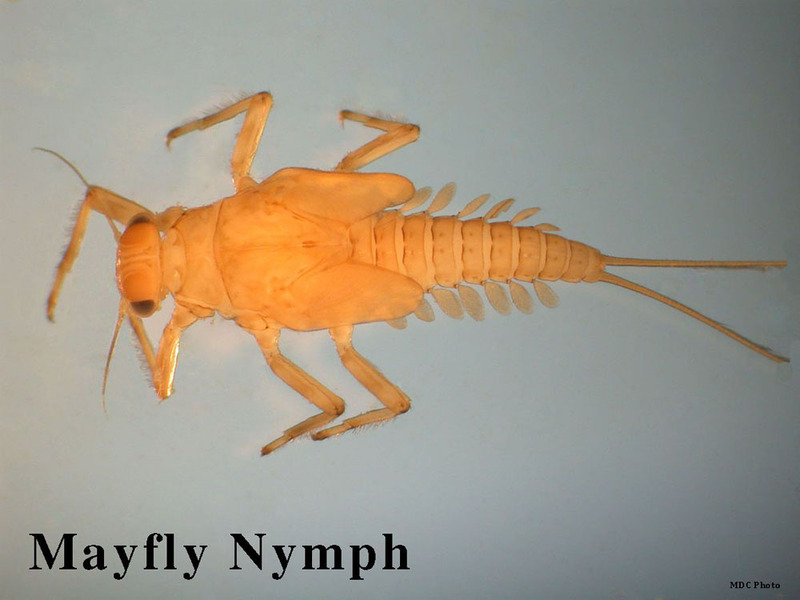 Mayfly nymphs have feathery or platelike gills on abdomen, legs end in one hook, usually three tails. 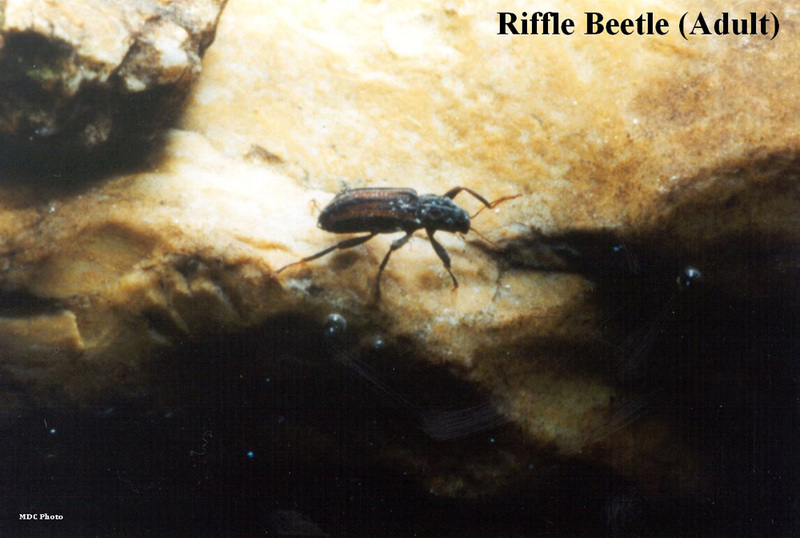 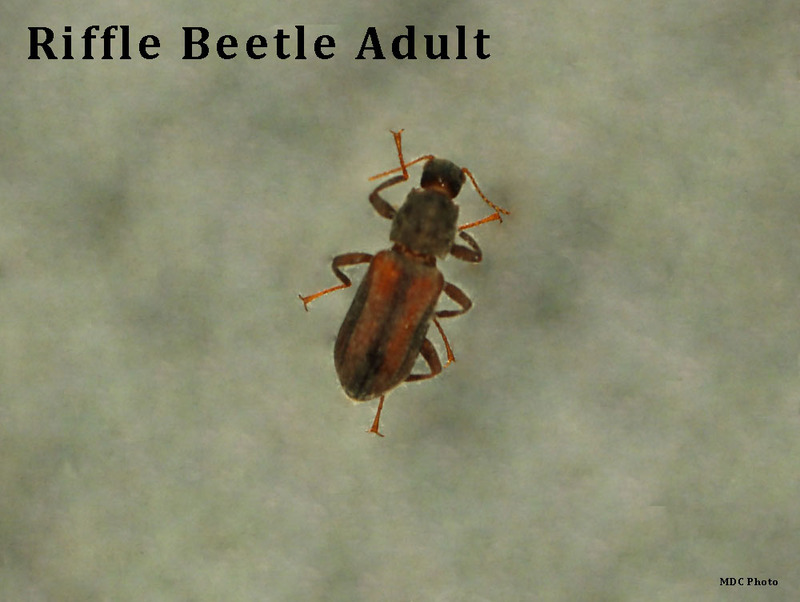 Adult riffle beetles are tiny six-legged beetles; crawls slowly on the bottom. 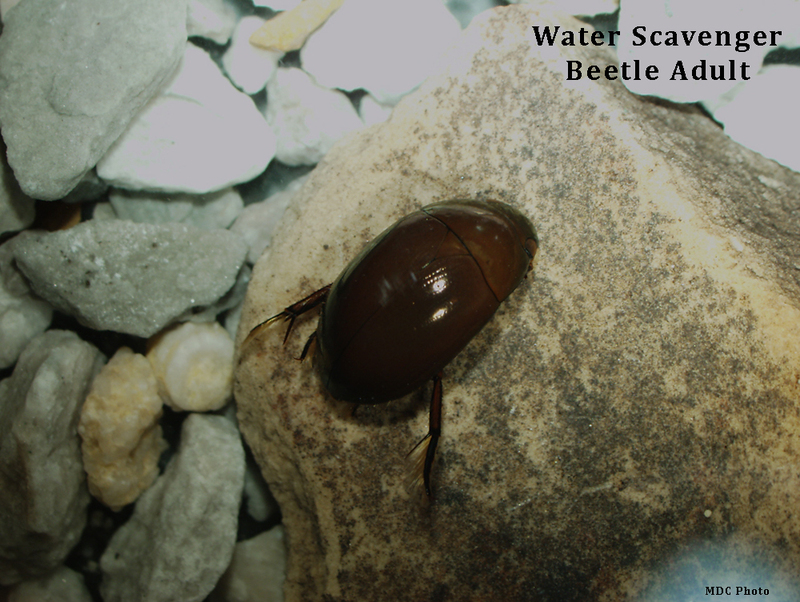 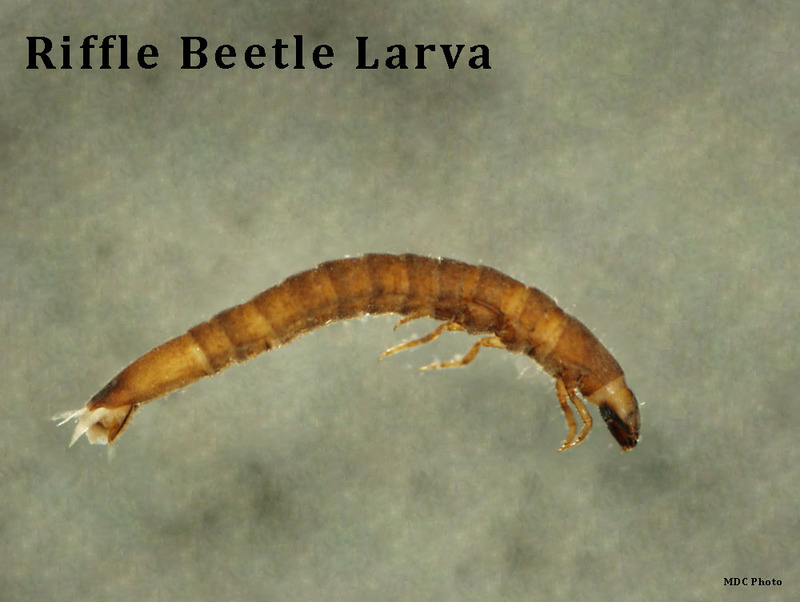 Larvae riffle beetles may appear uniform brown color or striped due to presence of hard plates covering body length and has six segmented legs on the thorax. 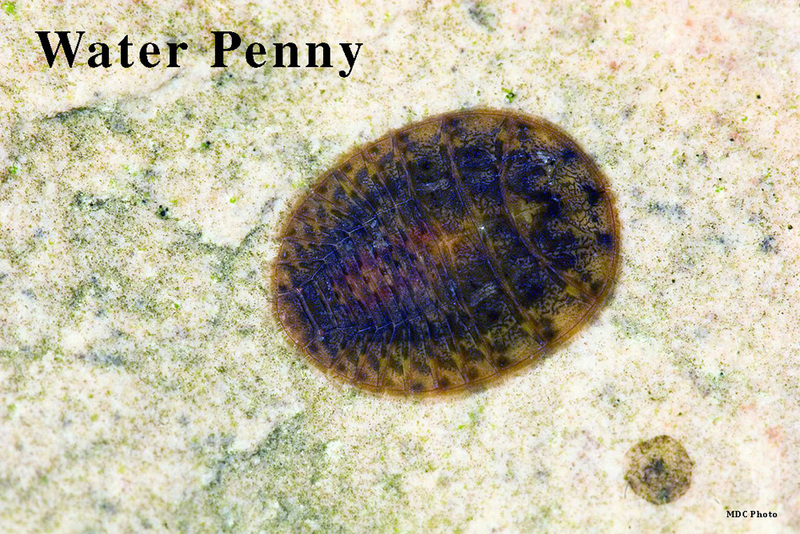 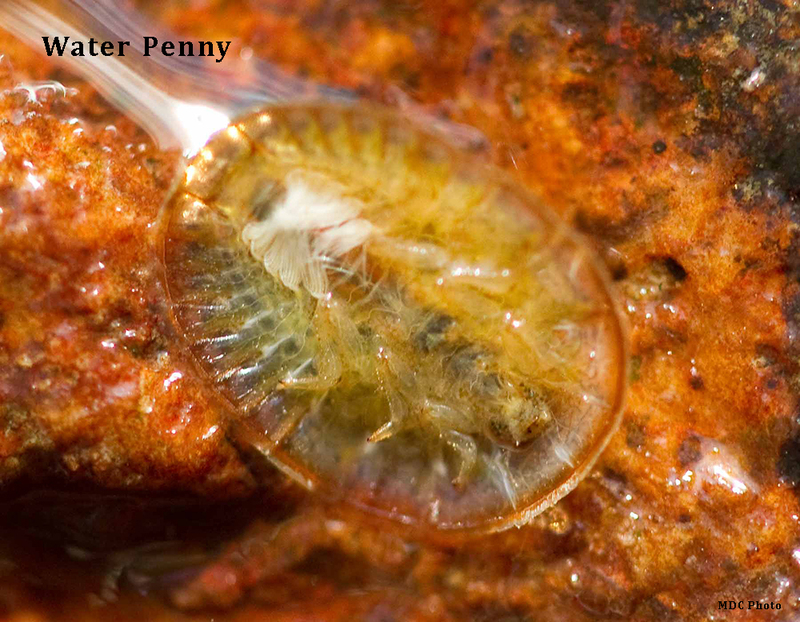 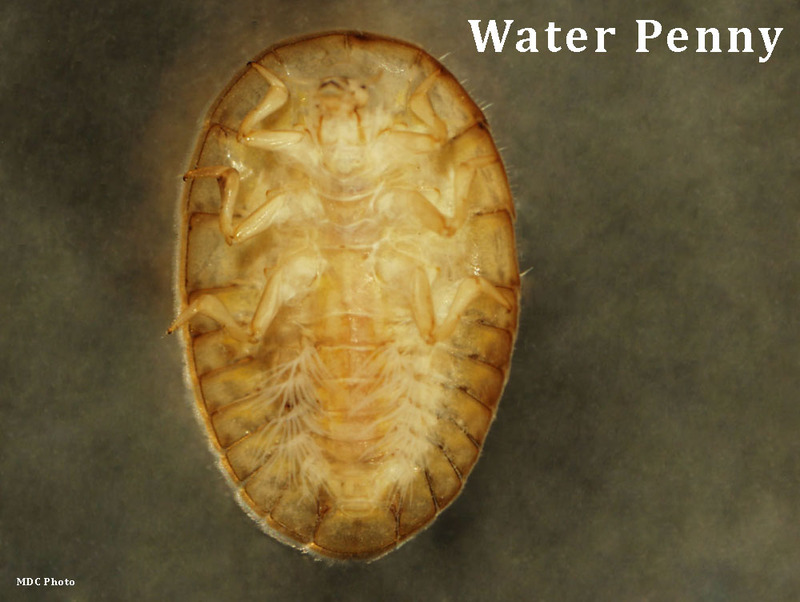 Water Penny larvae are flat and copper-colored like a penny; shaped like a small, upside-down saucer; segemented, hard plates conceals head and legs from above. 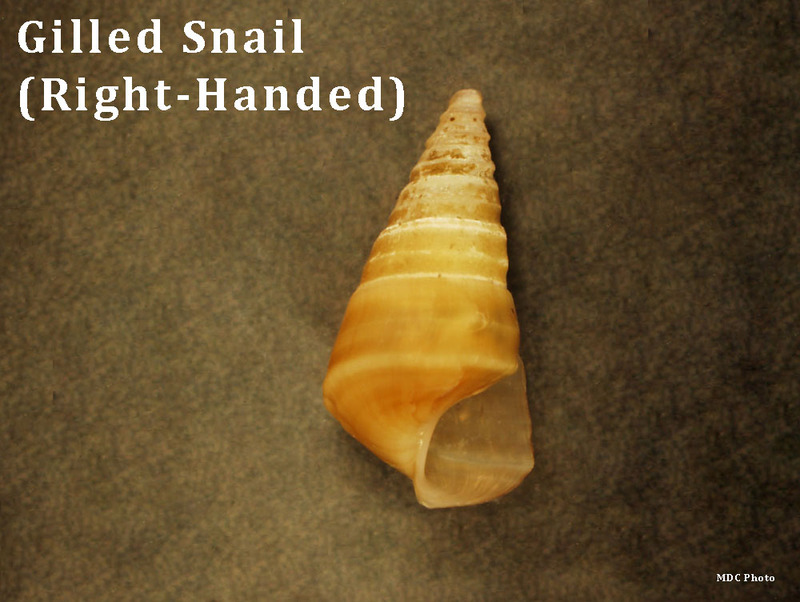 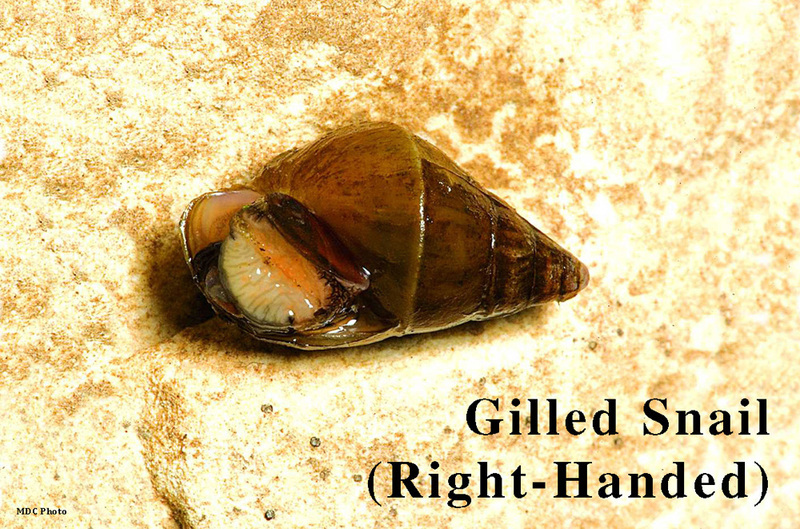 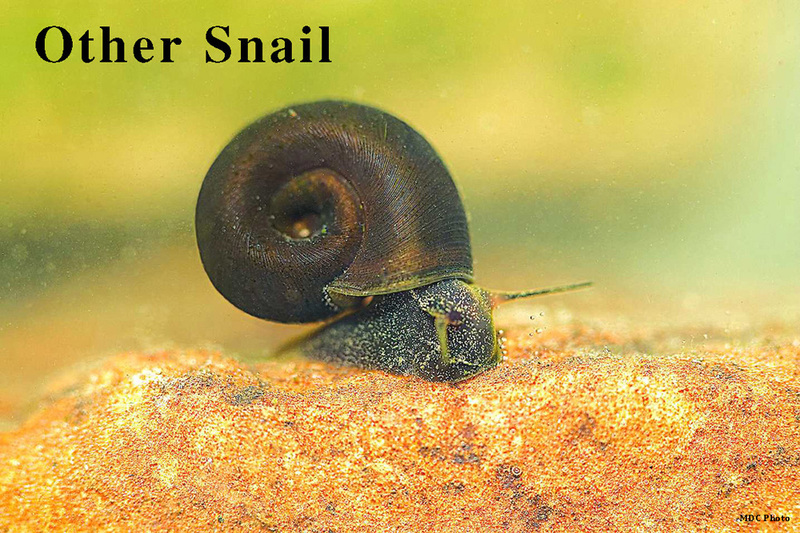 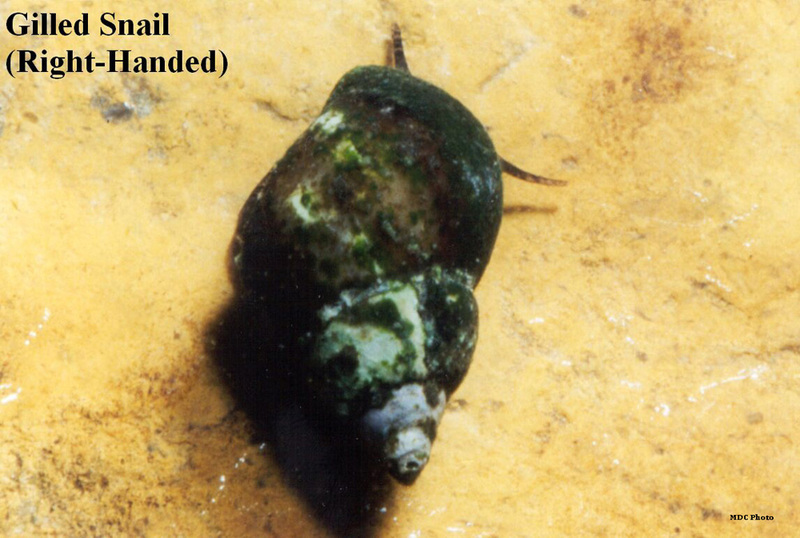 Gilled snails have shells openings to the right when the spiral is pointing up and the opening (aperture) is facing up. 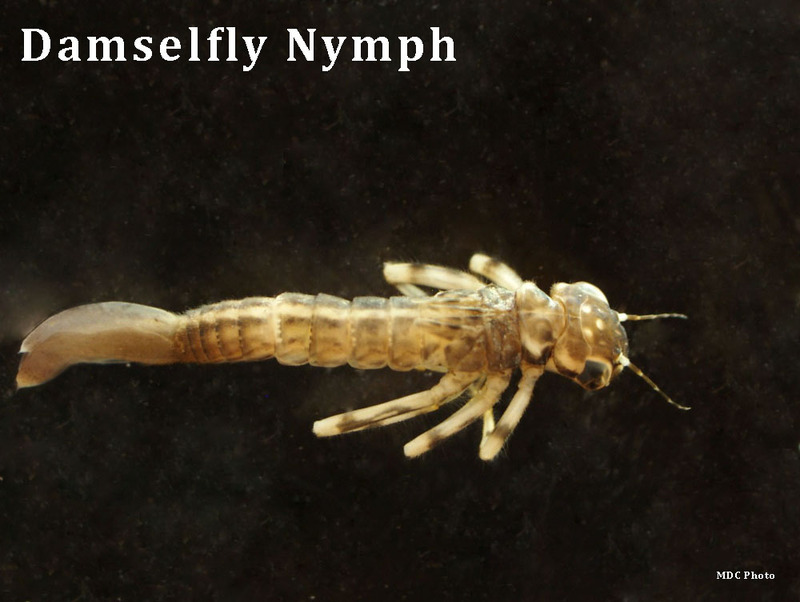 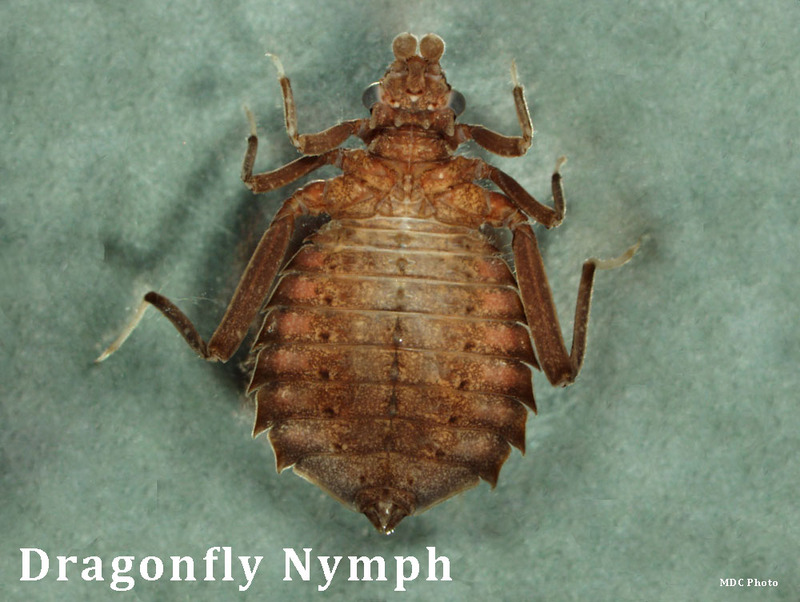 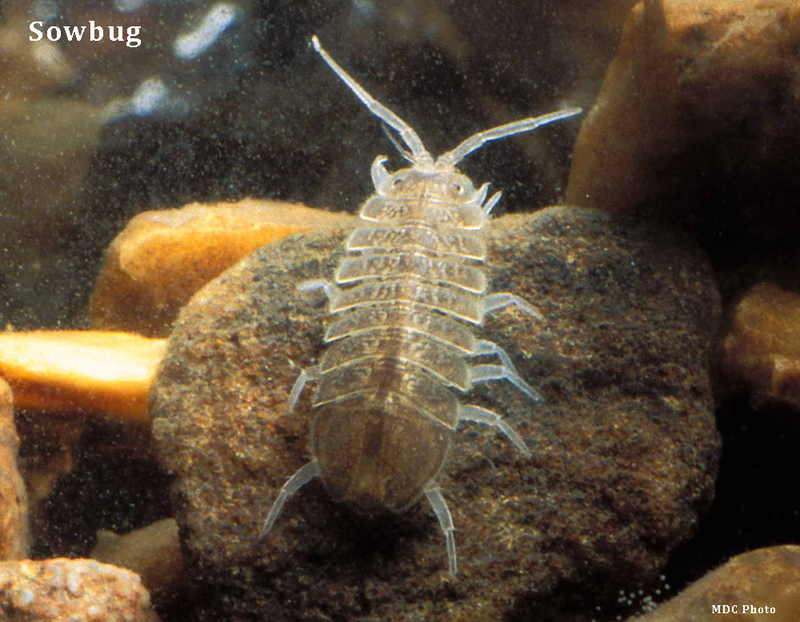 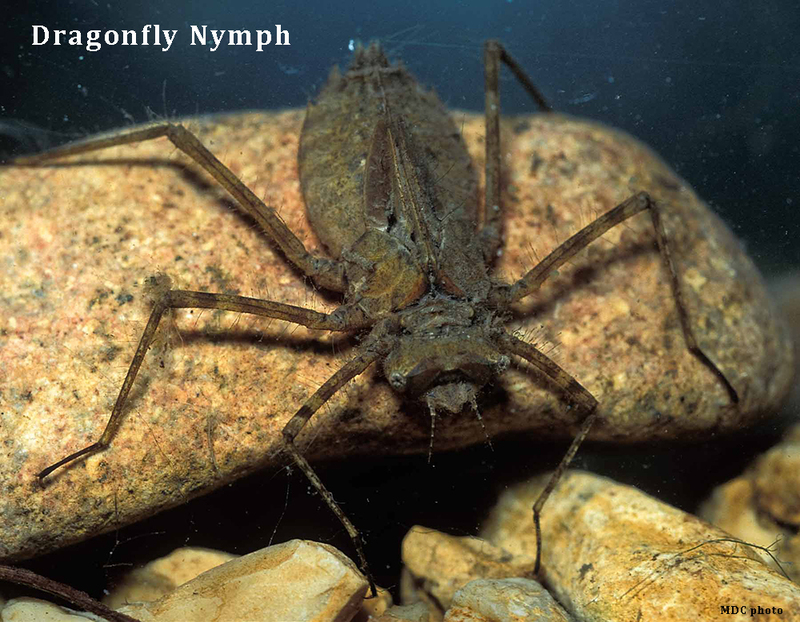 Dobsonfly larvae or Hellgrammites are up to 4 inches long, have hairlike gills under abdominal lateral filaments that look like dirty cotton and, have large mandibles. 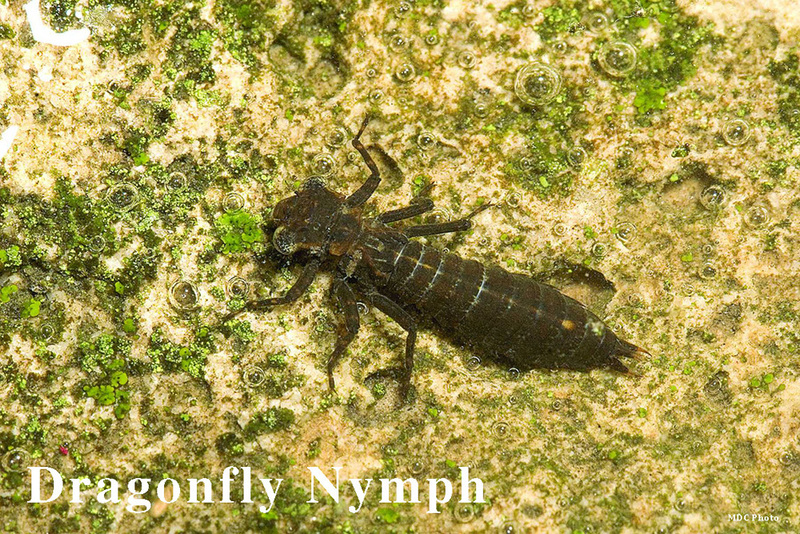 Dragonfly nymphs have a wide oval-to-round abdomen, which is often flattened and leaflike; large eyes; masklike lower lip. 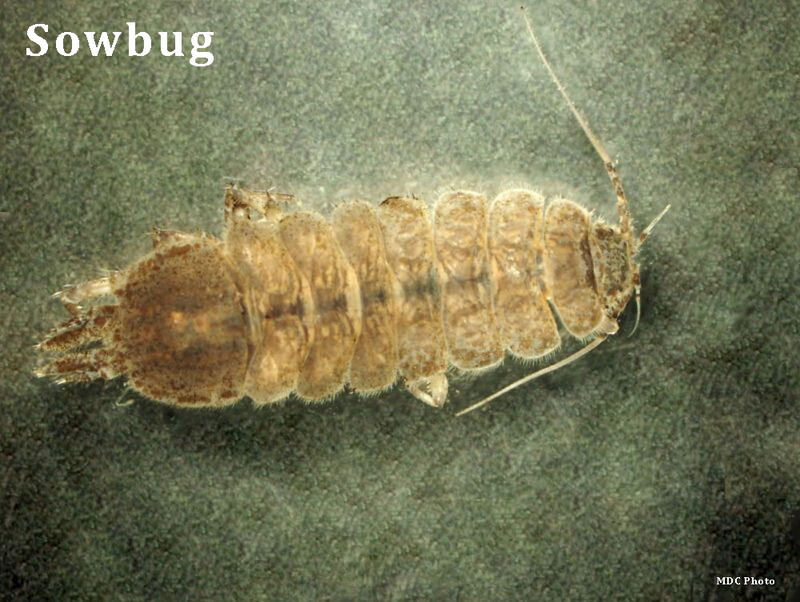 Sowbugs are generally gray; have oblong bodies; wider than it is high; seven pairs of legs; long antennae; looks similar to a roly-poly bug. 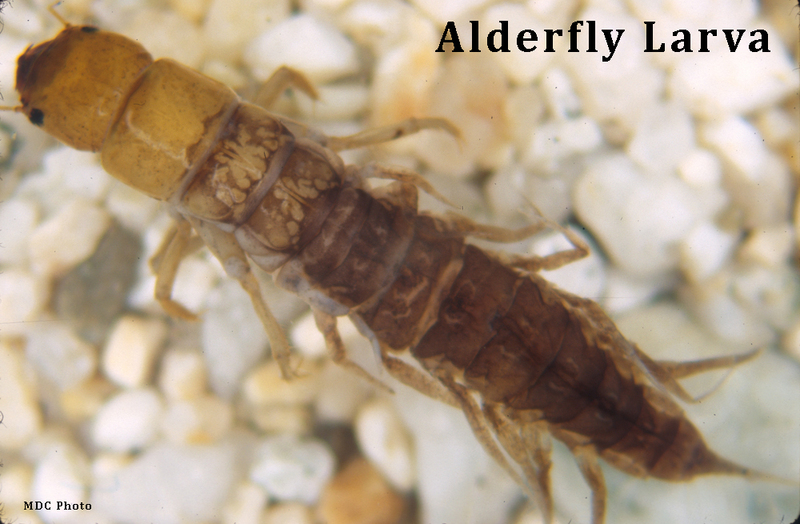 Alderfly larva look similar to the hellgrammite. 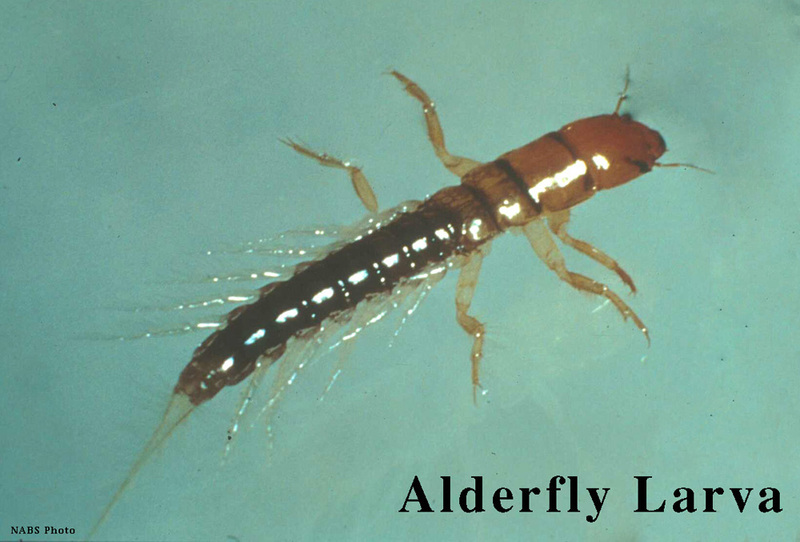 Lateral filaments with no visible gill tufts; one long hairlike tail at end of abdomen; tail resembles the capital letter "A" at the base. 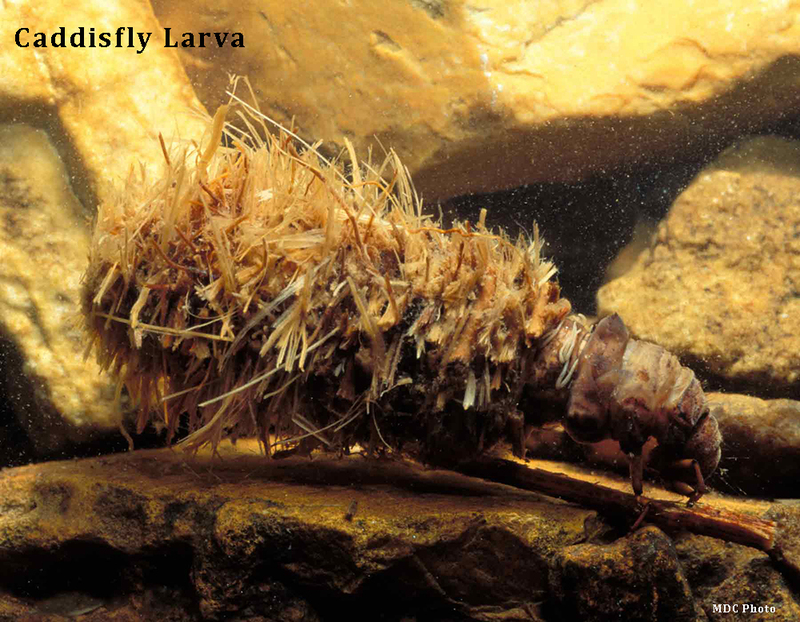 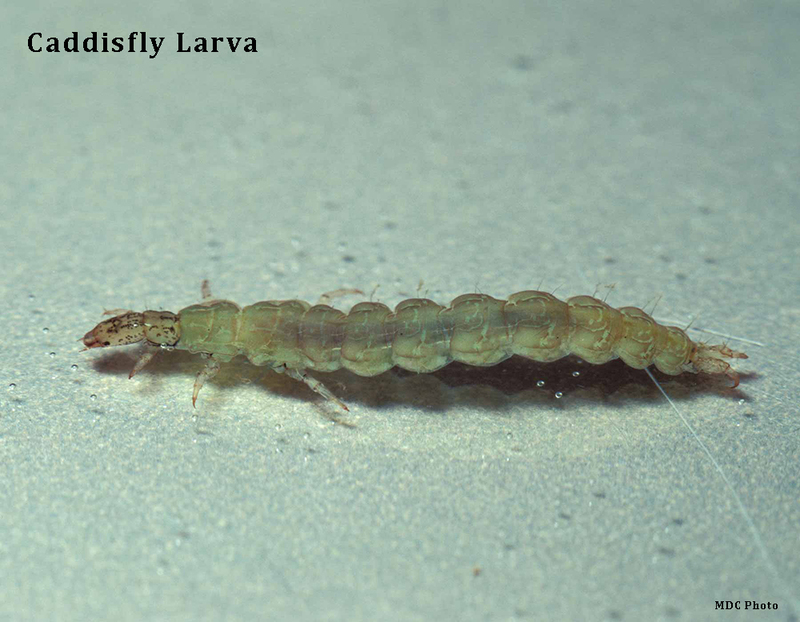 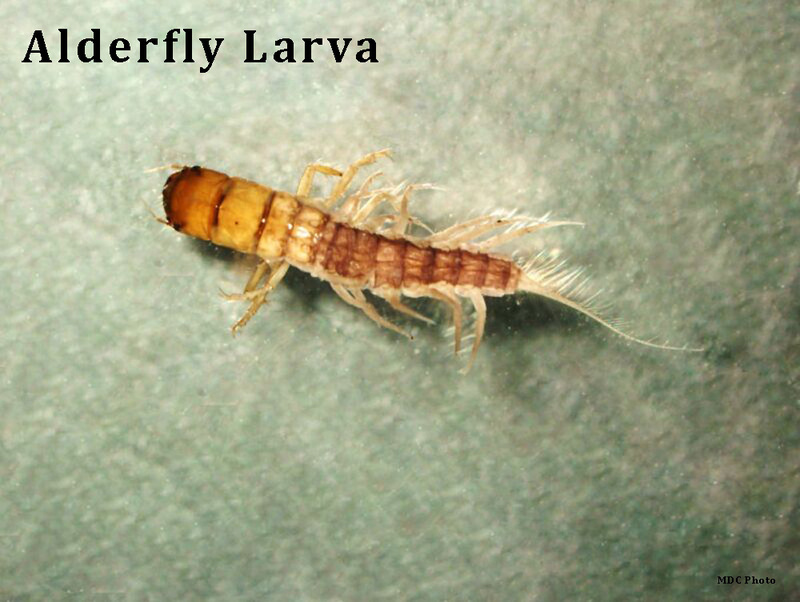 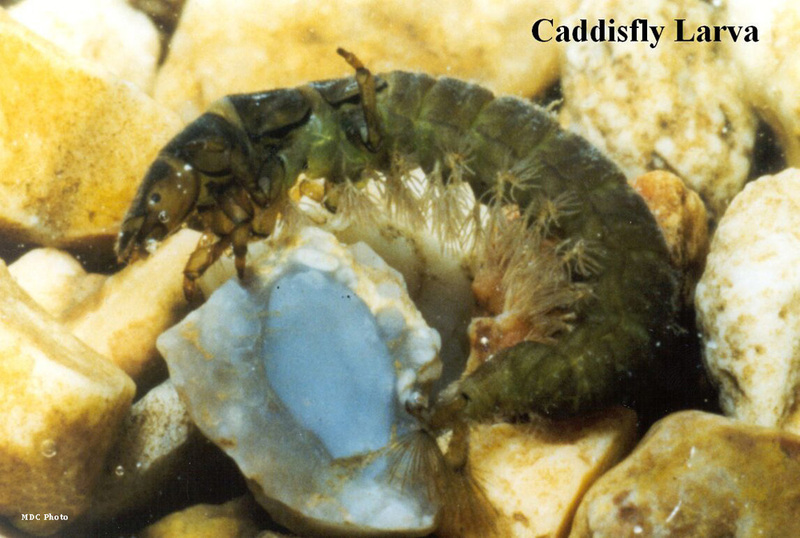 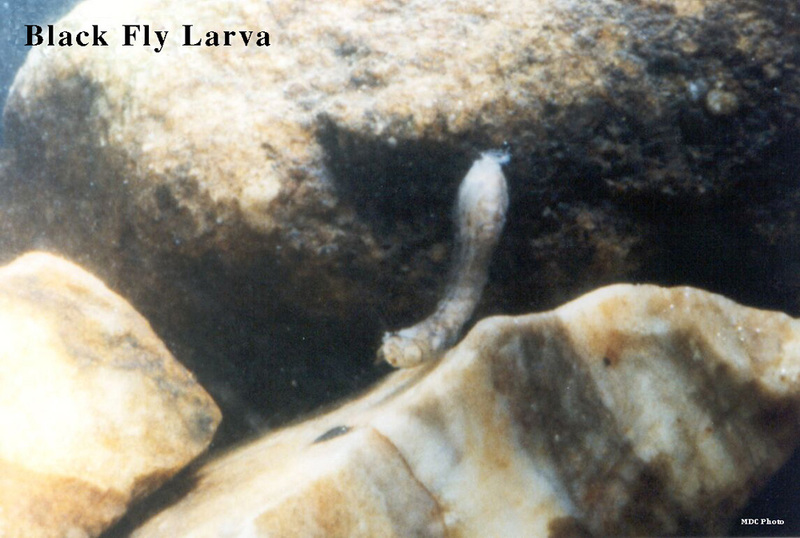 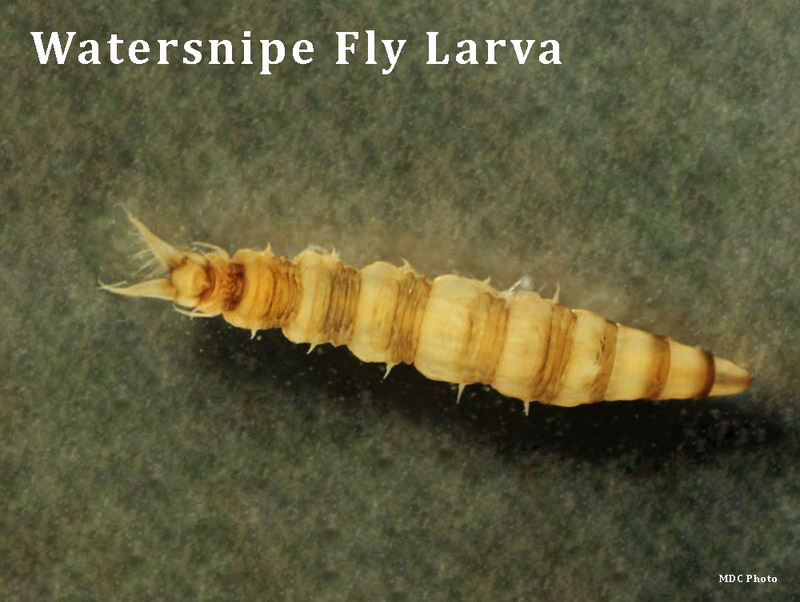 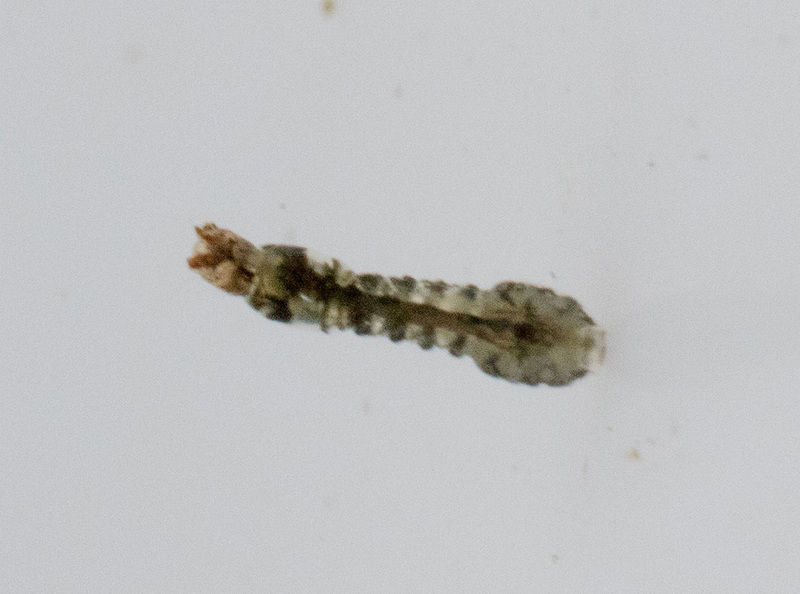 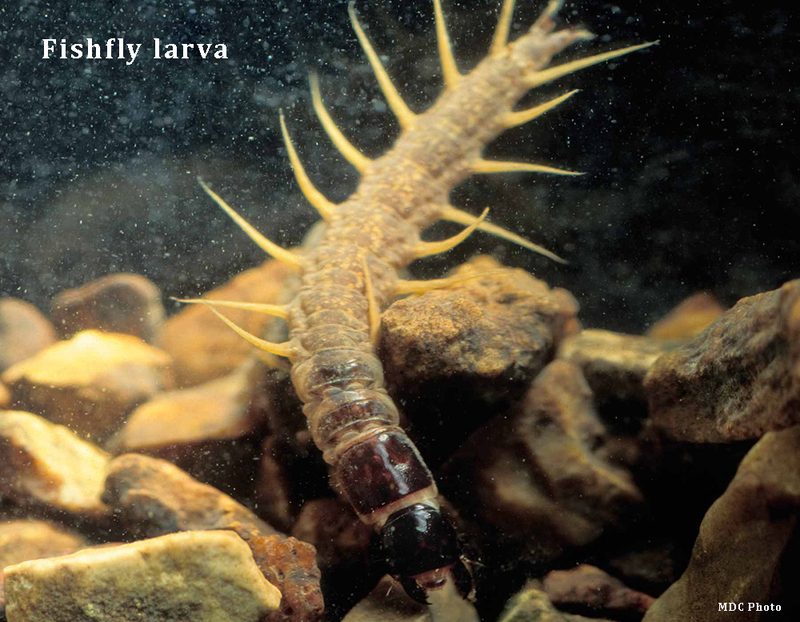 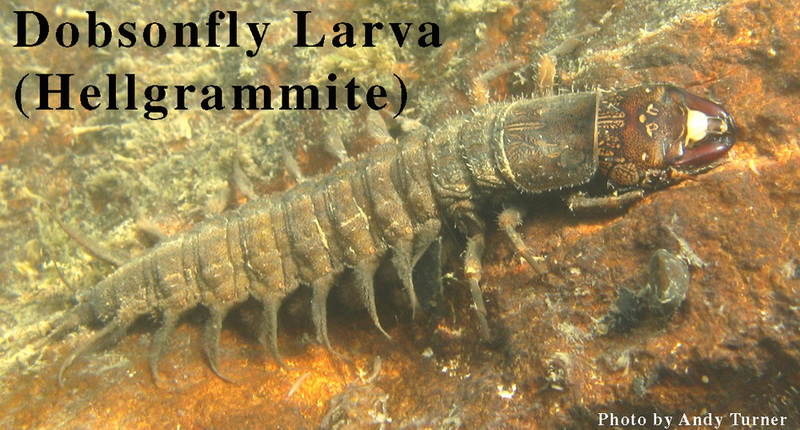 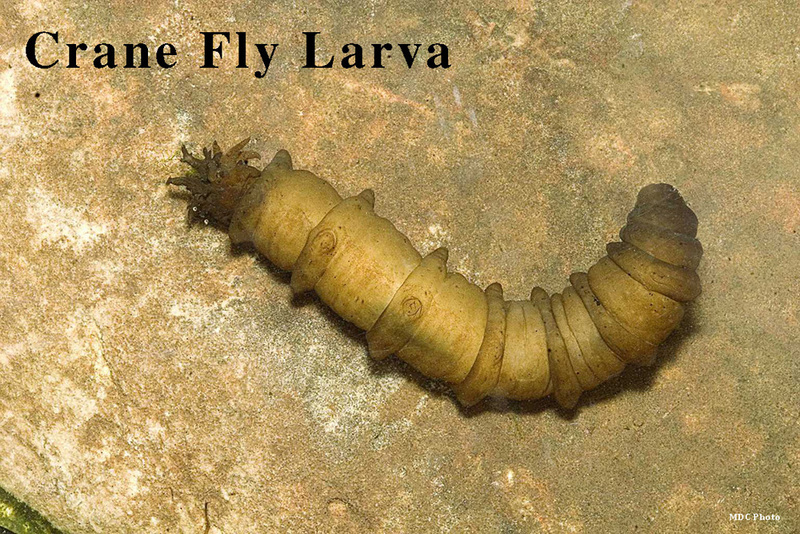 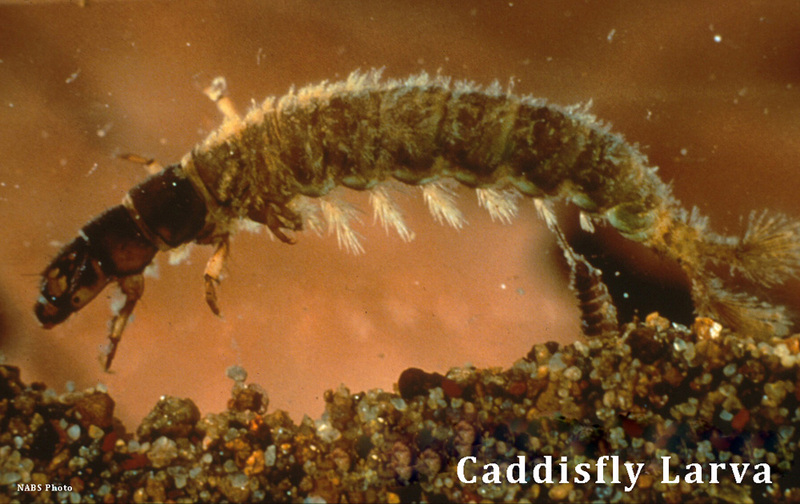 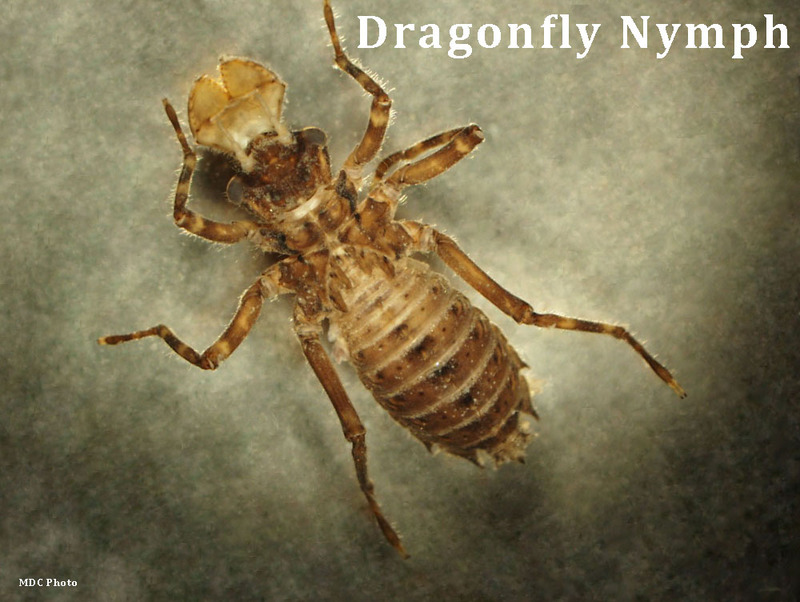 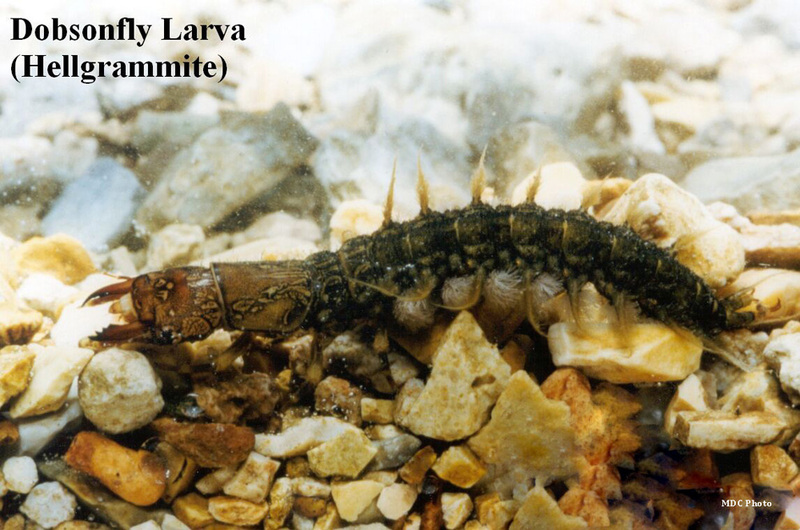 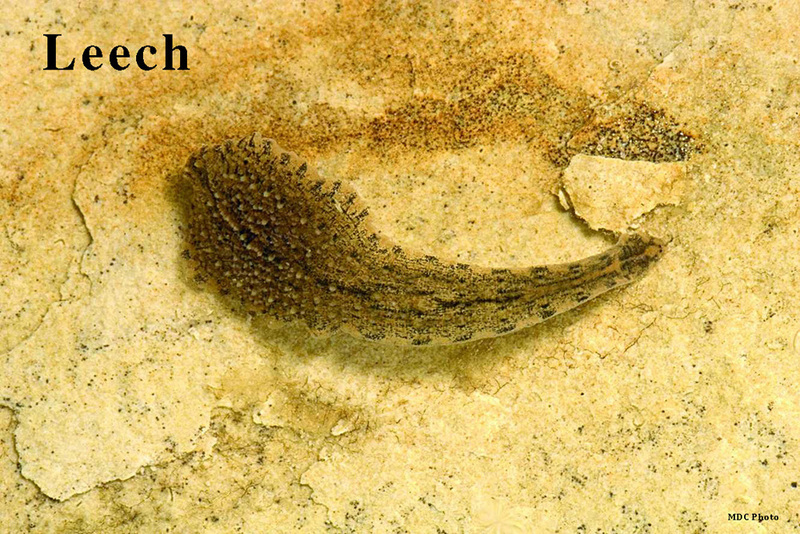 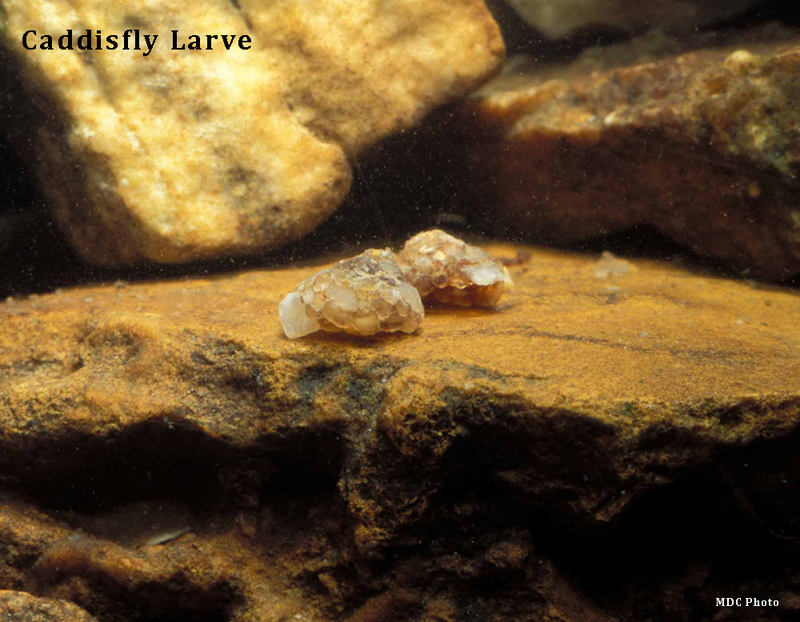 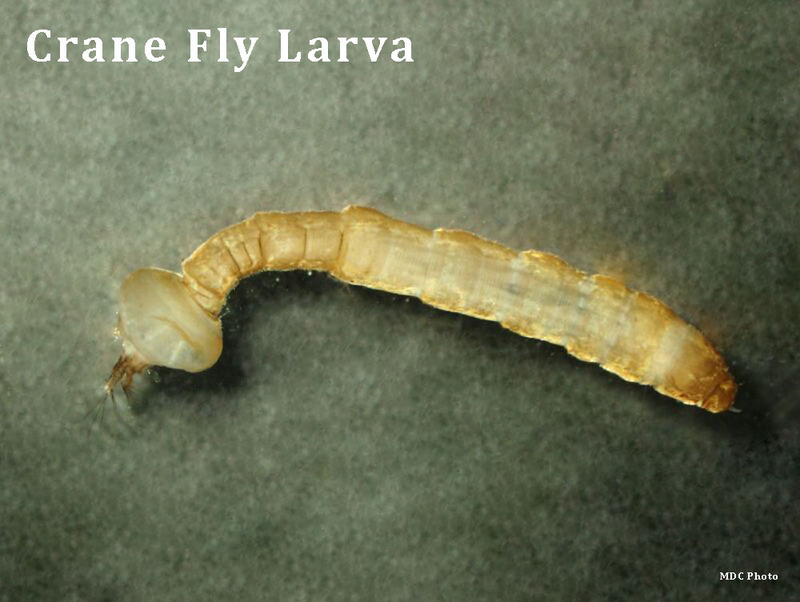 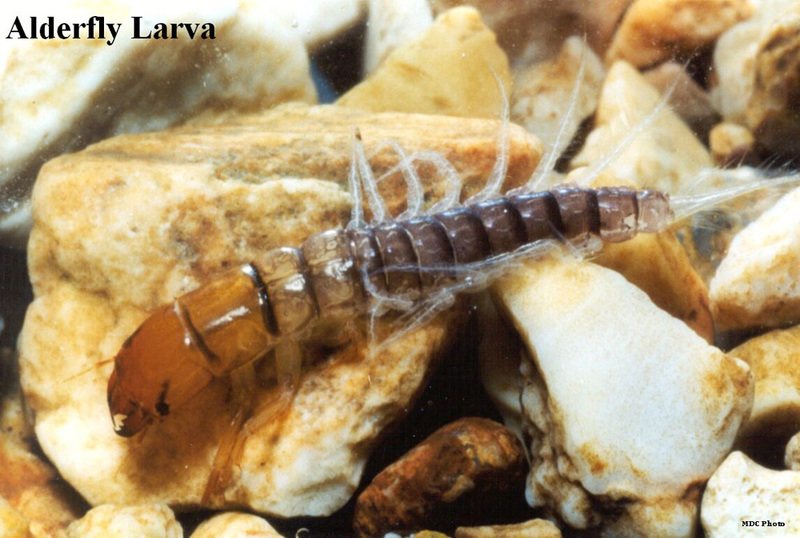 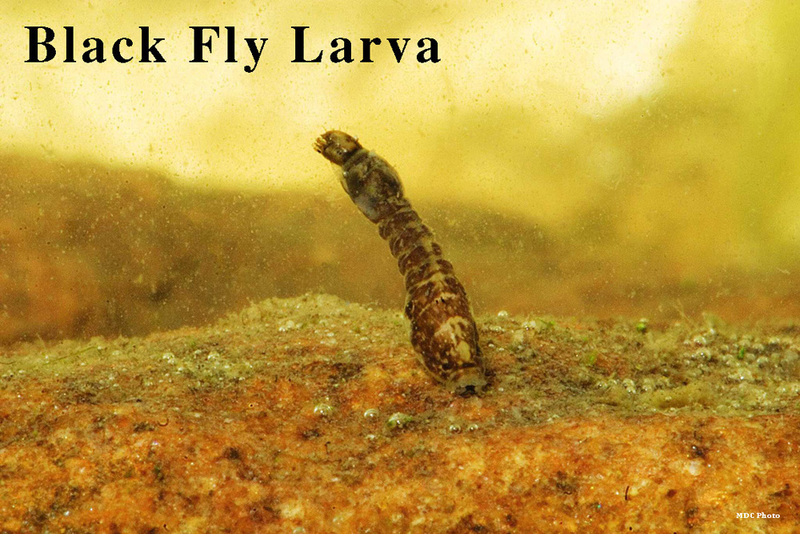 Fishfly larva look like a small hellgrammite but often a lighter reddish-tan color with yellowish streaks. 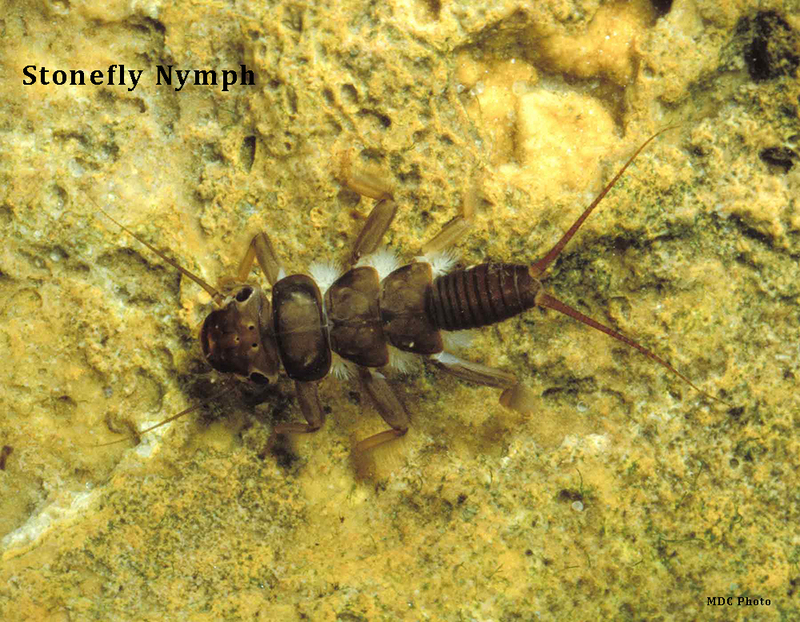 They have lateral filaments on the abdomen but no gill tufts underneath. 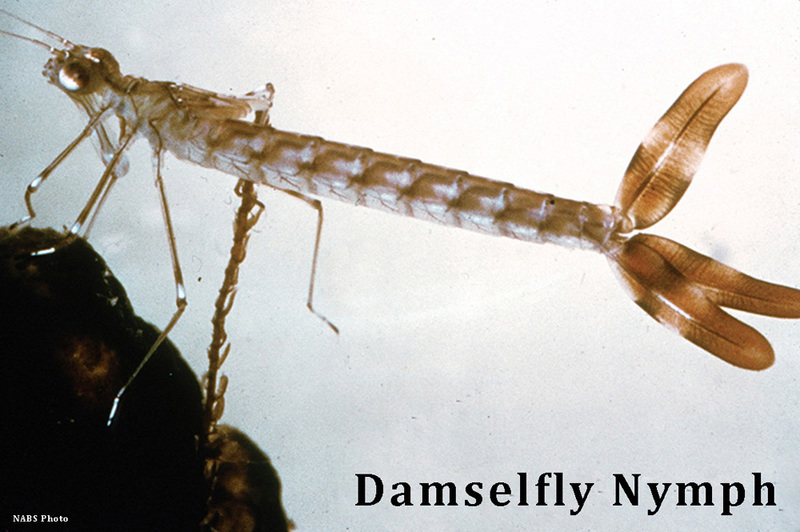 Damselfly nymphs have large eyes, six thin hooked legs, three broad oar-shaped tails (gills). 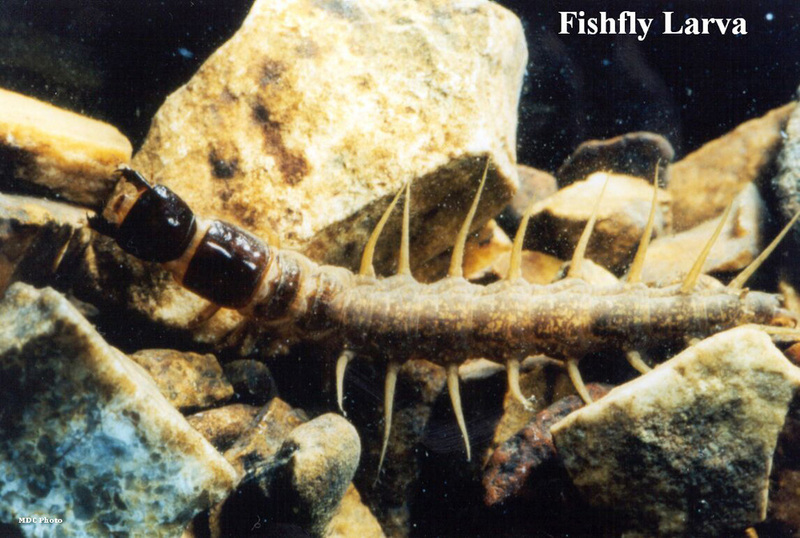 They will position themselves in a tripod stance to utilize gills. 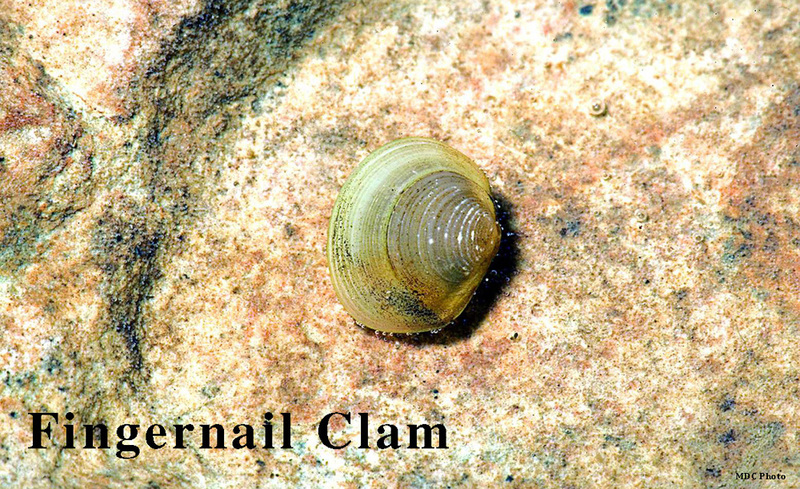 Two-piece (bivalve) shell with two opposing valves connected by a hinge, size range from 1/16 inch to 10 inches. 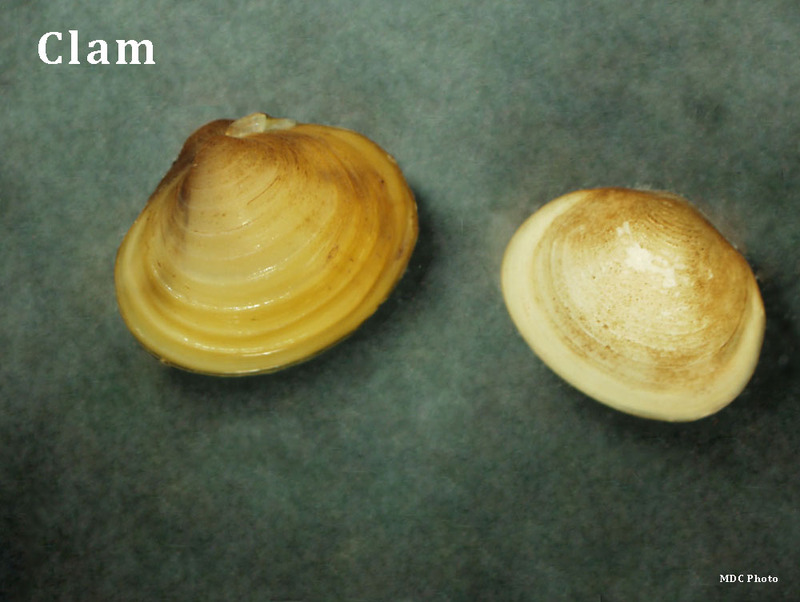 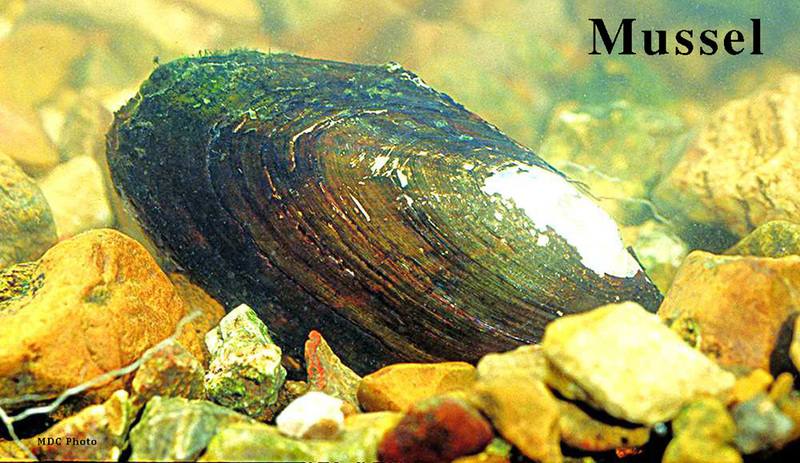 Do not count empty shells and always return live organisms back to the stream quickly with the umbo or hinge up. 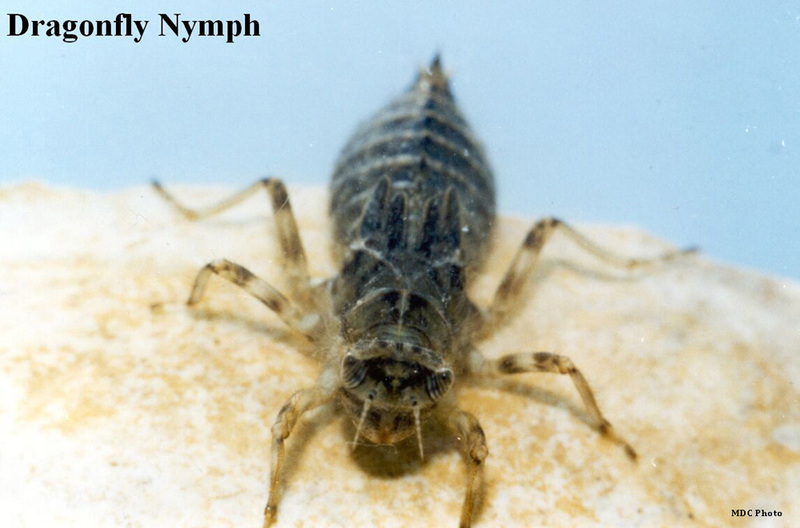 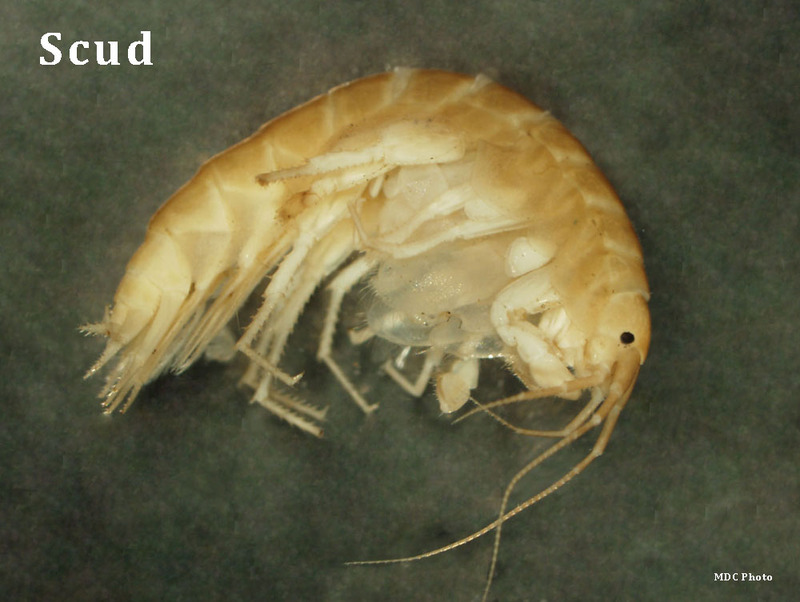 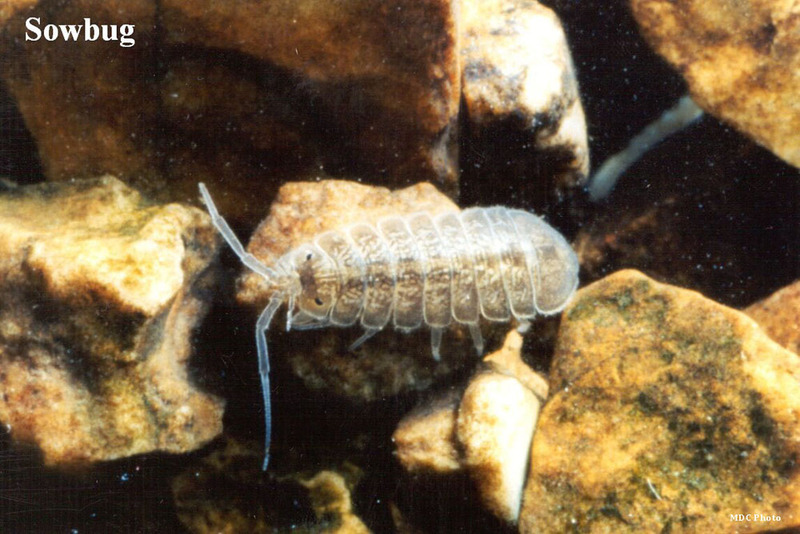 Scuds are white to gray in color, have a body that is higher than it is wide, and have more than six legs. 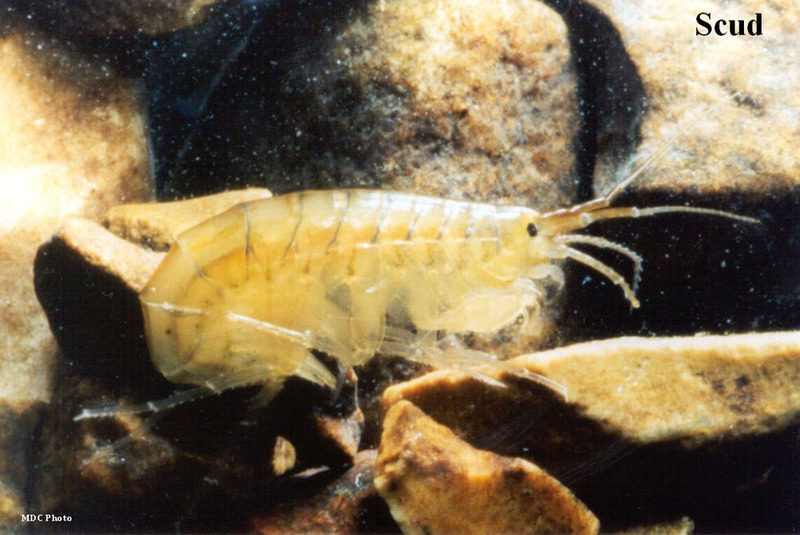 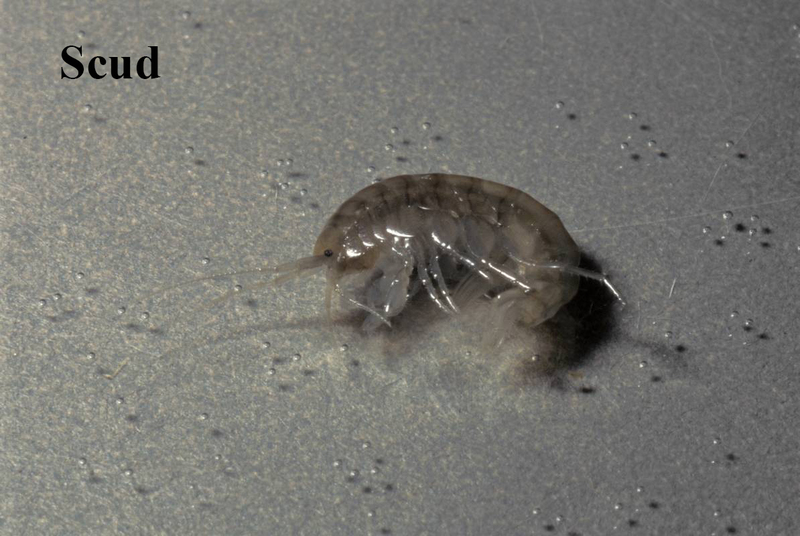 They swim sideways and resemble small shrimp. 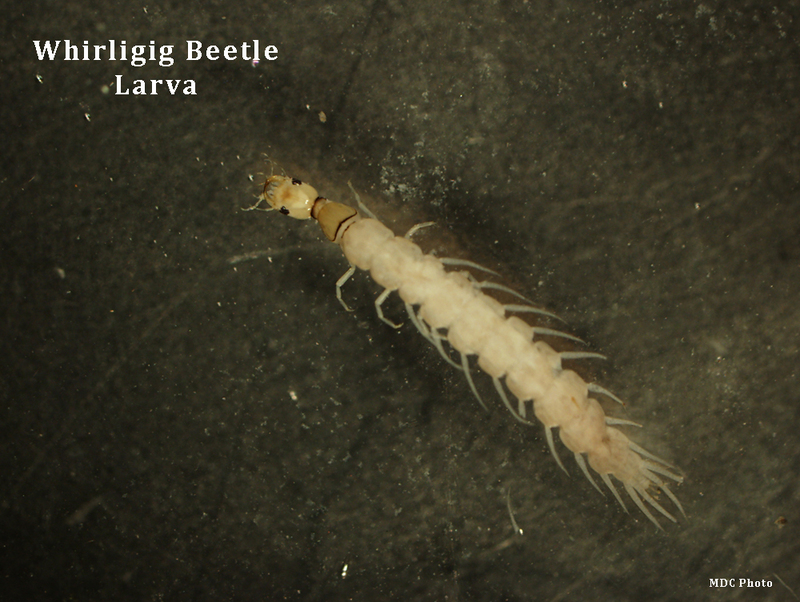 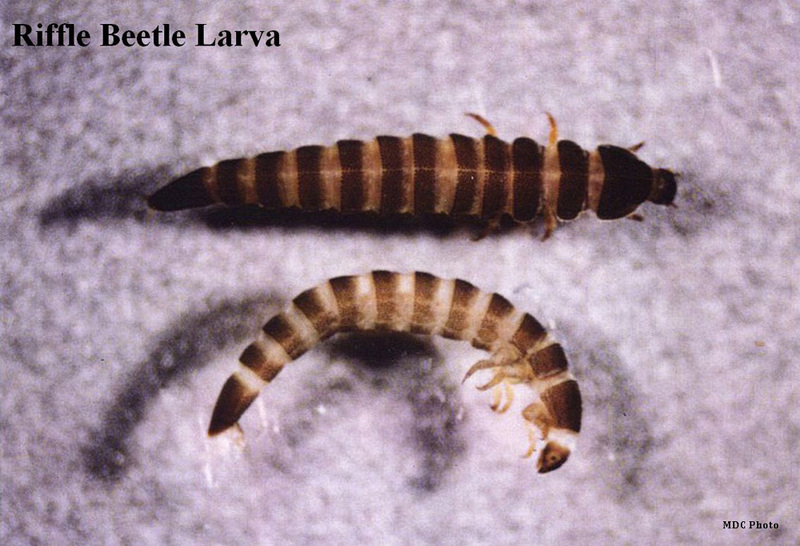 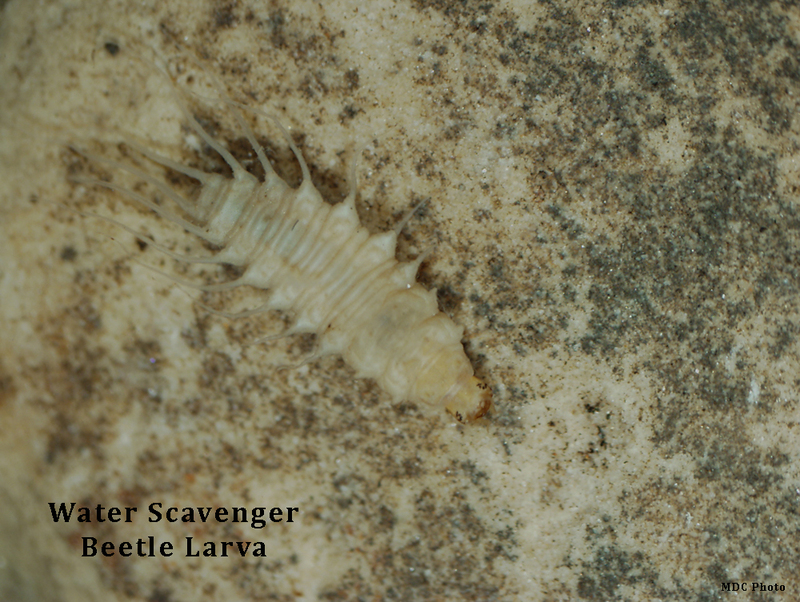 Other beetle larva are a diverse group. 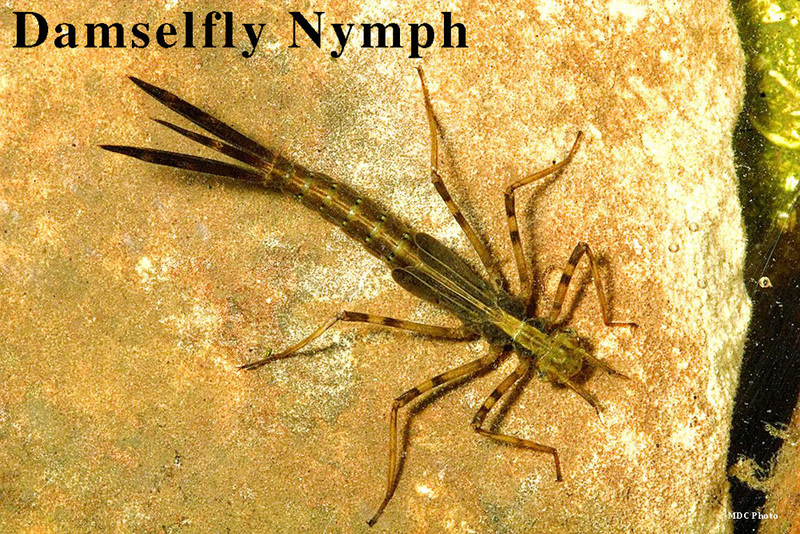 They will have obvious mouthparts and six legs. 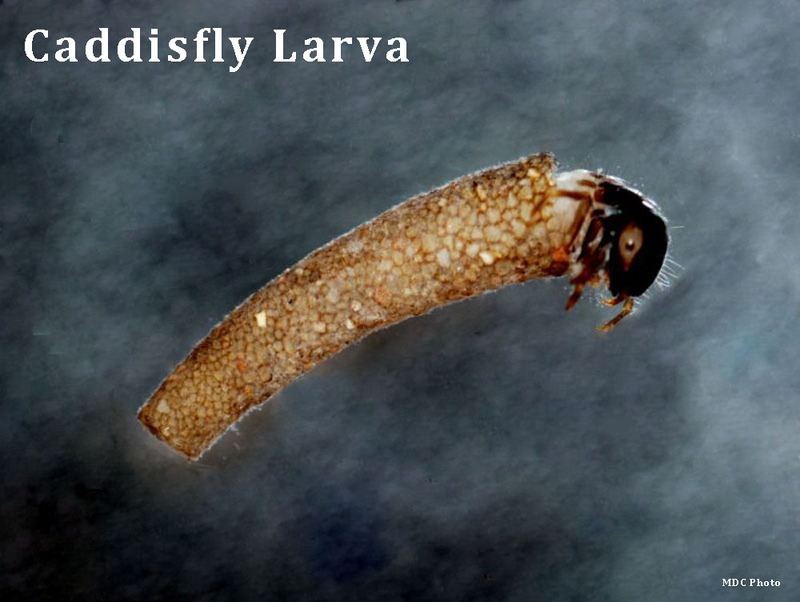 Watersnipe fly larva have a tapered body, many caterpillar-like legs, conical head, and two feathery 'horns' at the end of the abdomen. 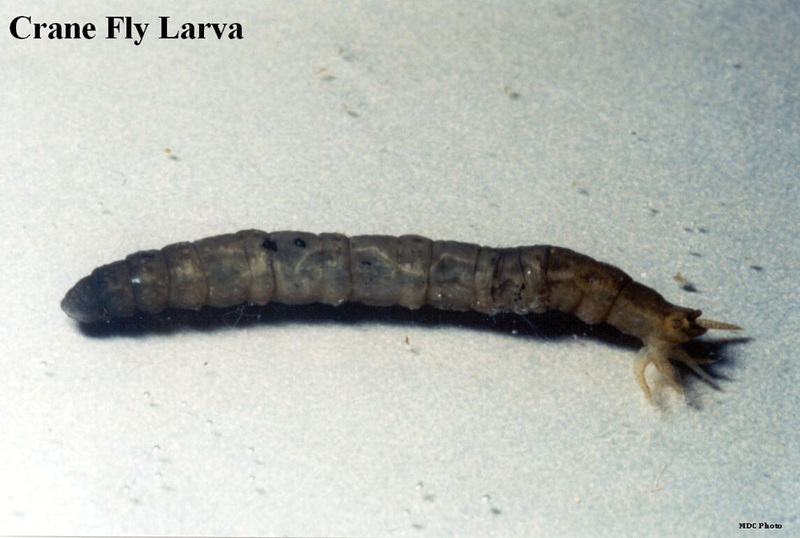 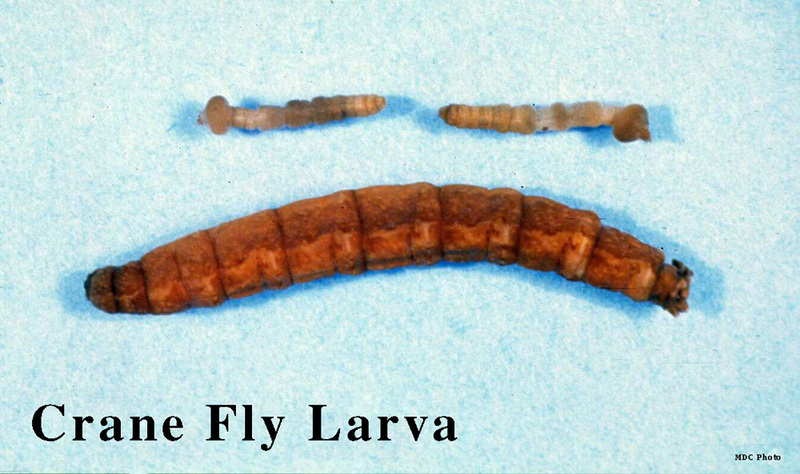 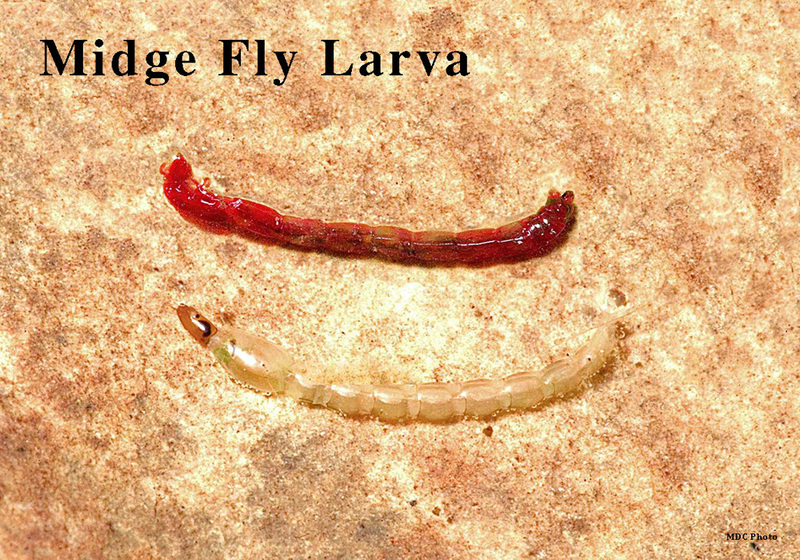 Crane Fly larva have a plump caterpillar-like segmented body. 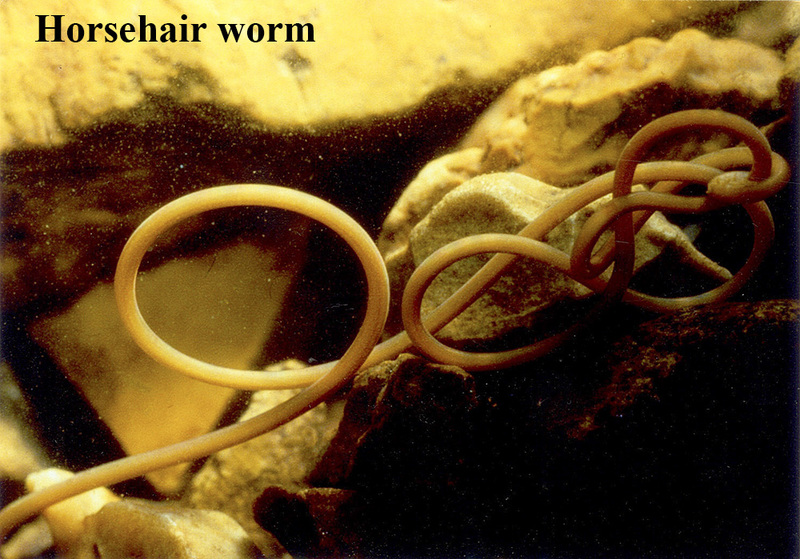 It may have an enlarged (turnip-like) lobe or fleshy fingerlike extensions at the end of the abdomen. 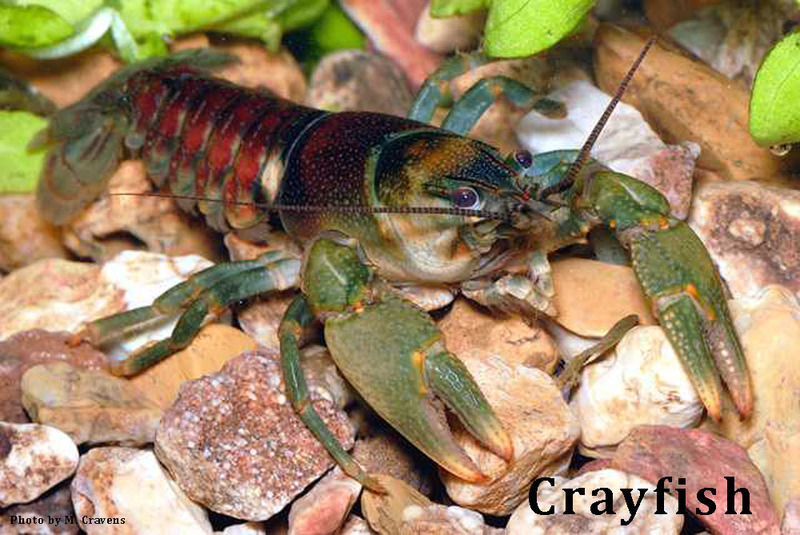 Crayfish have two large claws and eight walking legs. 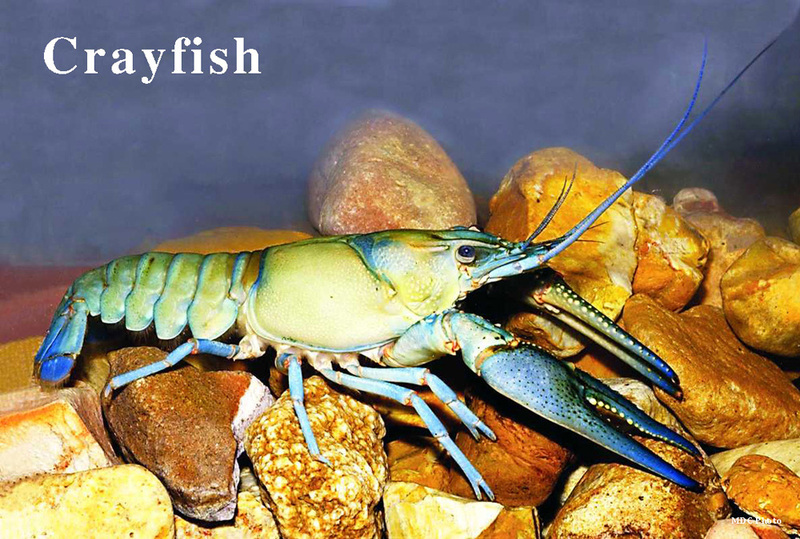 They resemble small lobsters. 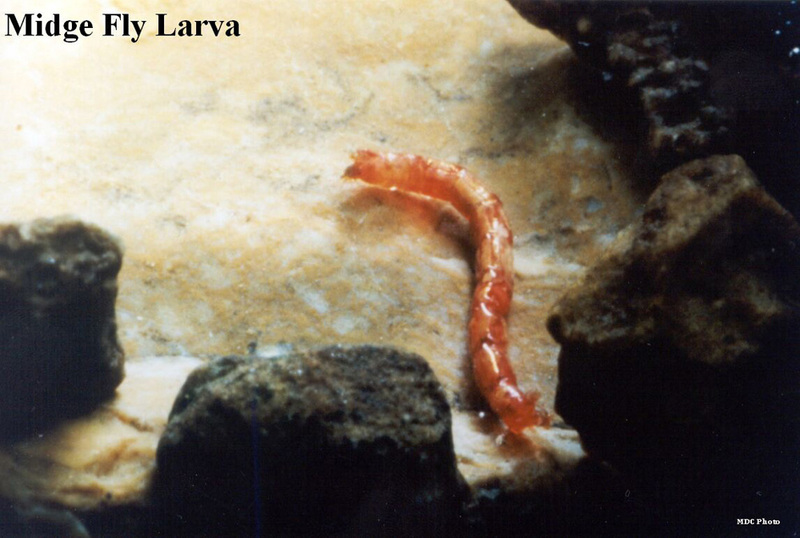 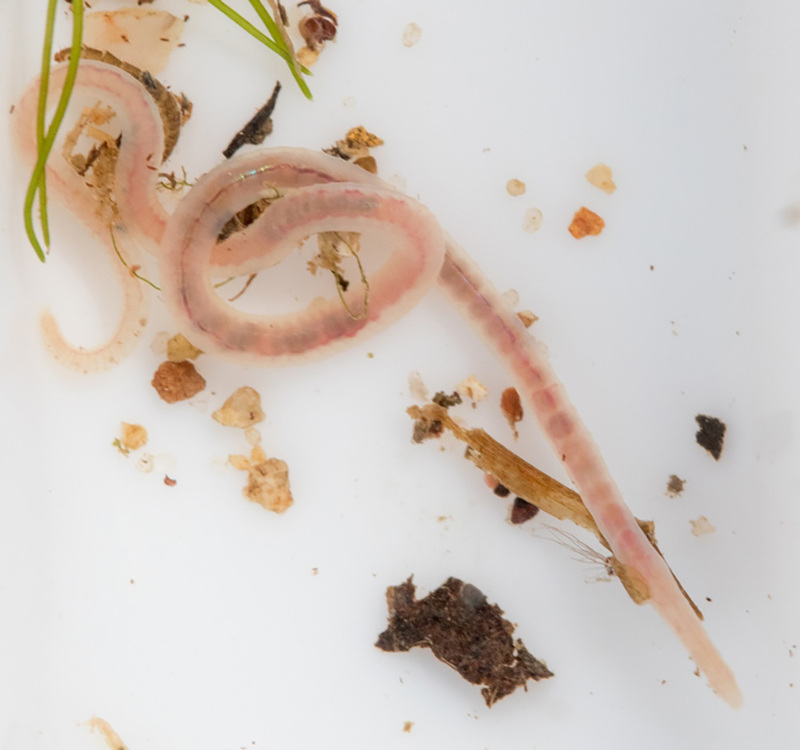 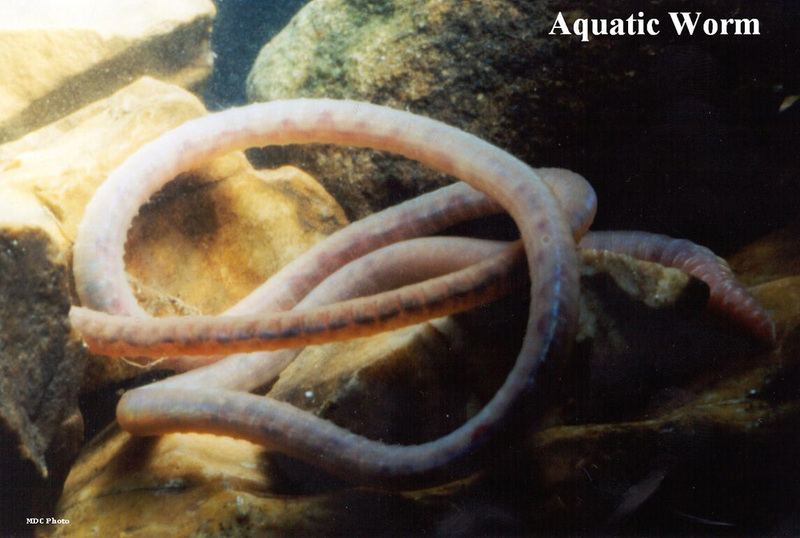 Aquatic earthworms are segmented, long, thin and often curl back around themselves. 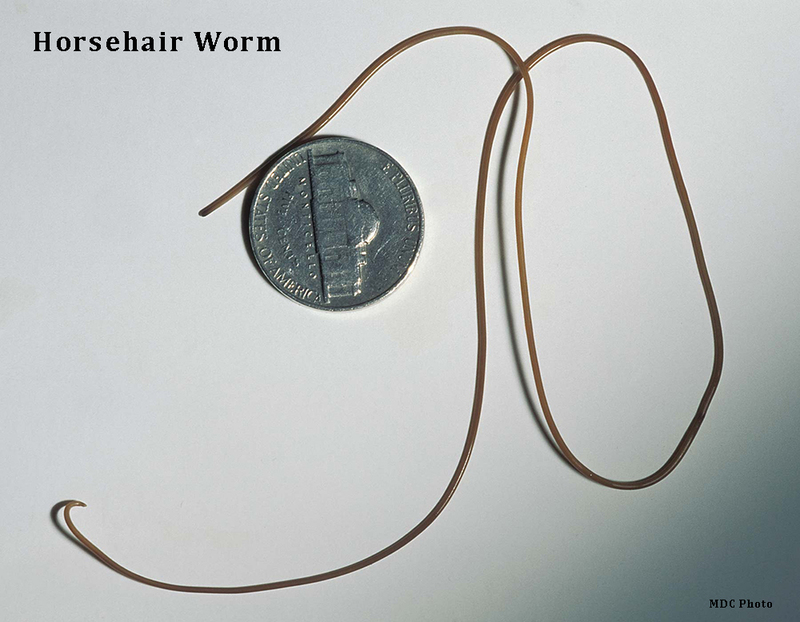 The resemble terrestrial earthworms. 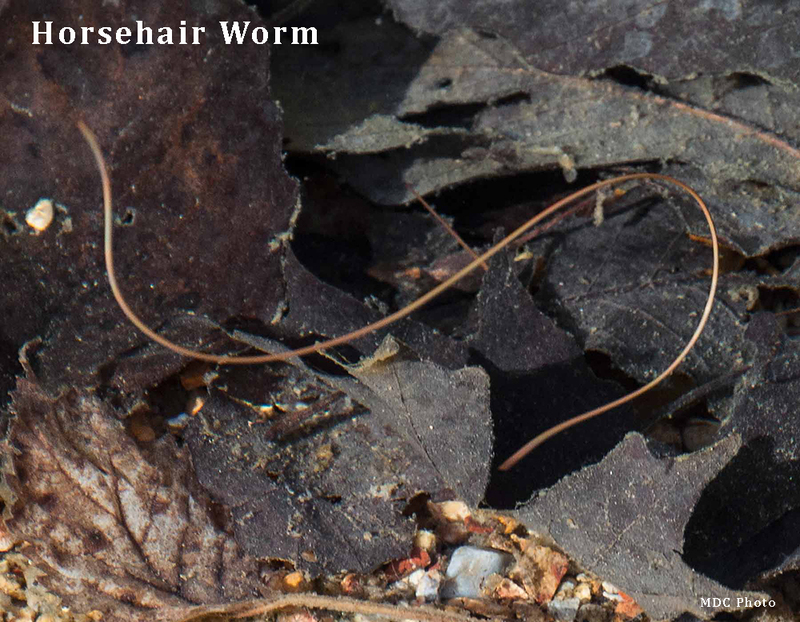 Horsehair worms are not segmented and have a round or cylindrical body. 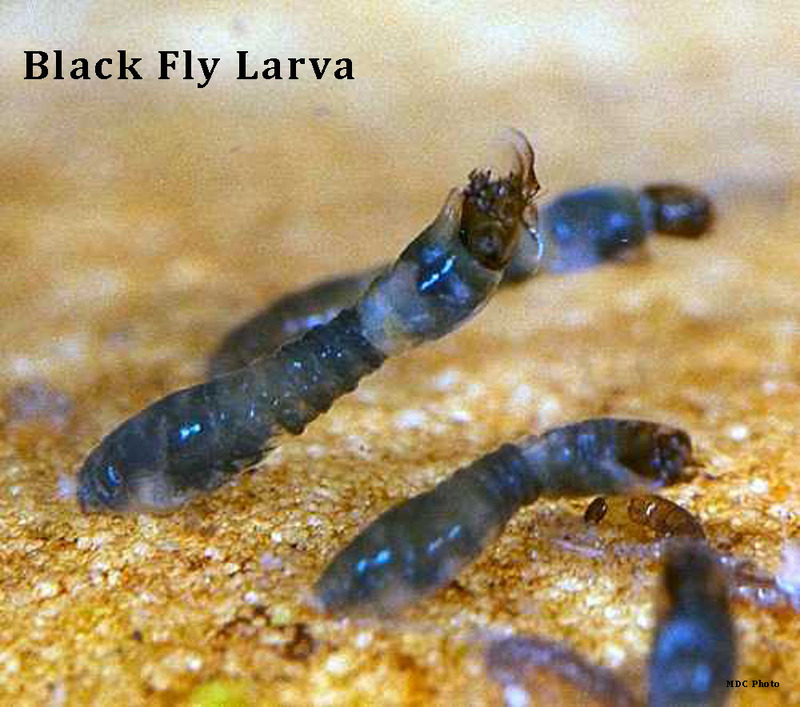 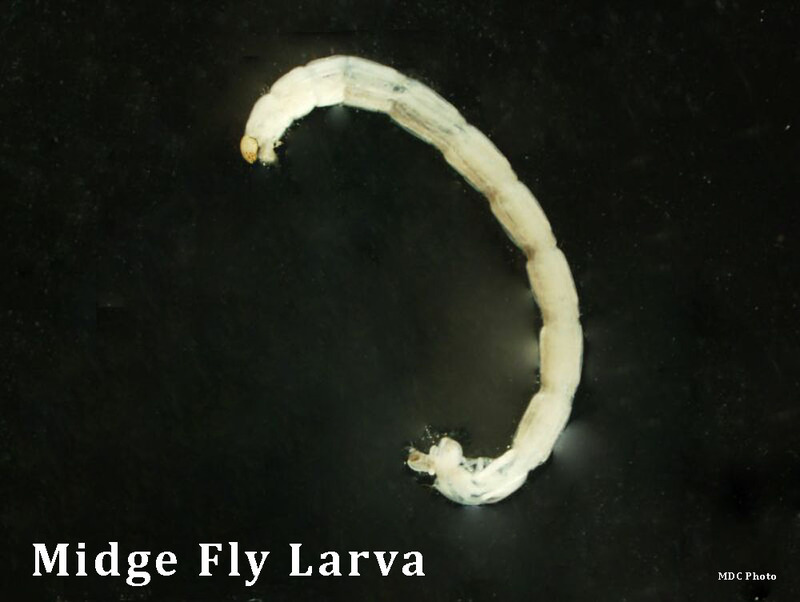 Black fly larvae have a wide "fat" bottom with suction pad on one end and two fan-like structures on their head. 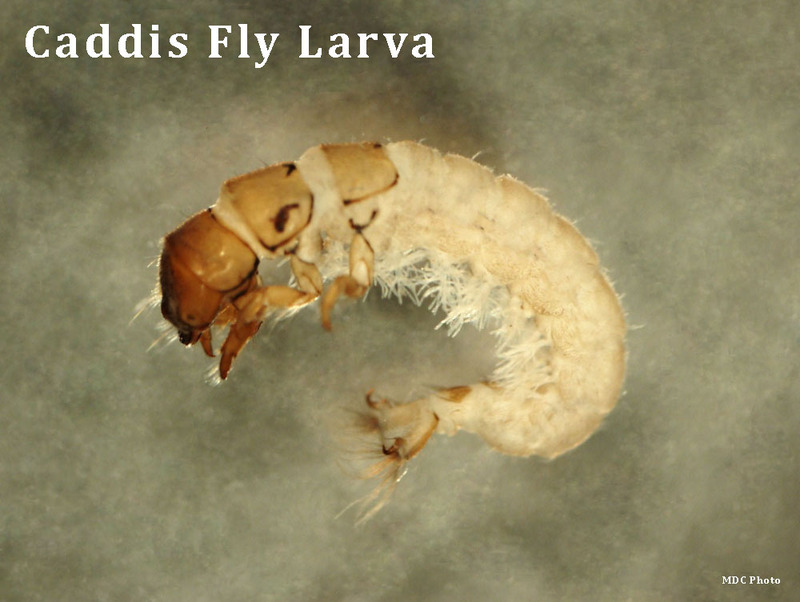 Midge Fly larva have a distinct head, wormlike segmented body, and a pair of tiny prolegs under the head and near the tip of the abdomen. 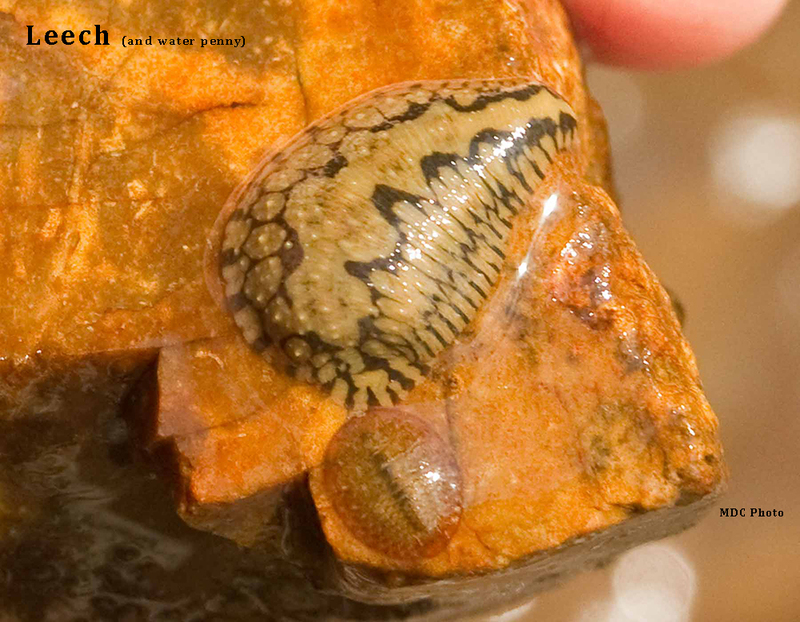 Leeches have flattened muscular bodies with suction pads on each end. 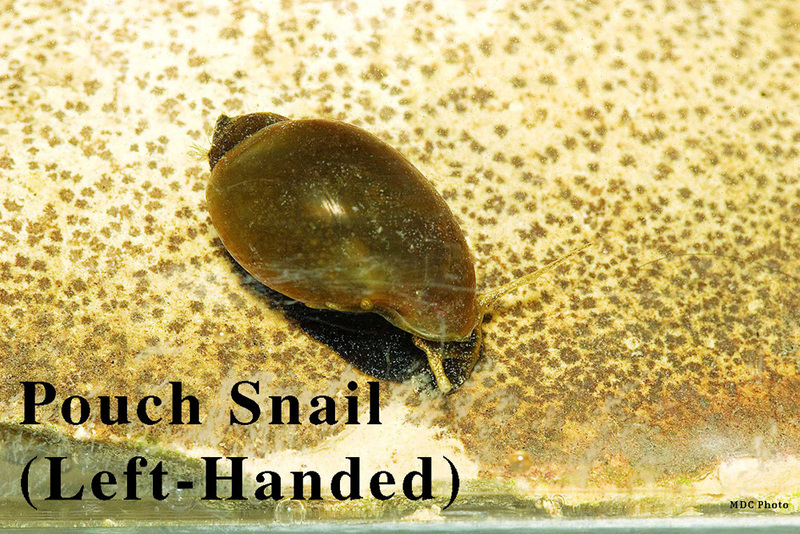 Pouch snails do not have an operculum covering the shell opening. 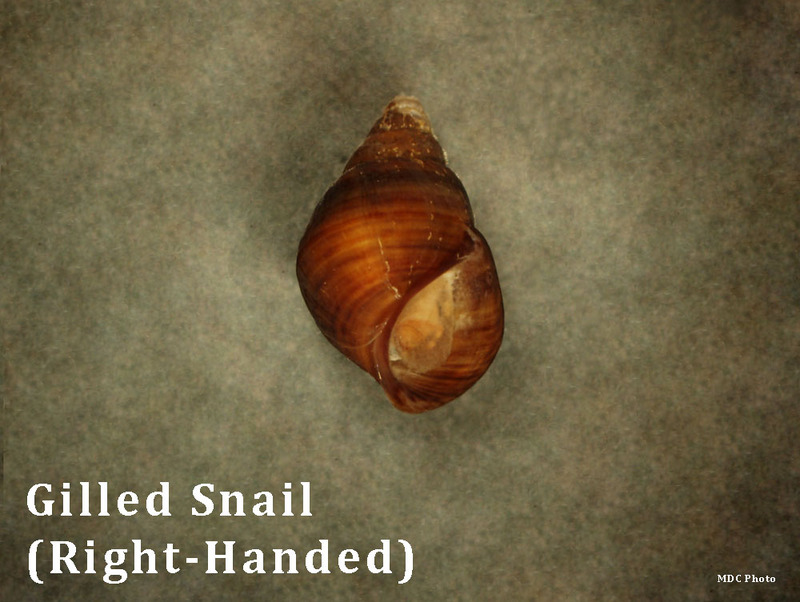 When pointed up and facing you they usually open to the left. 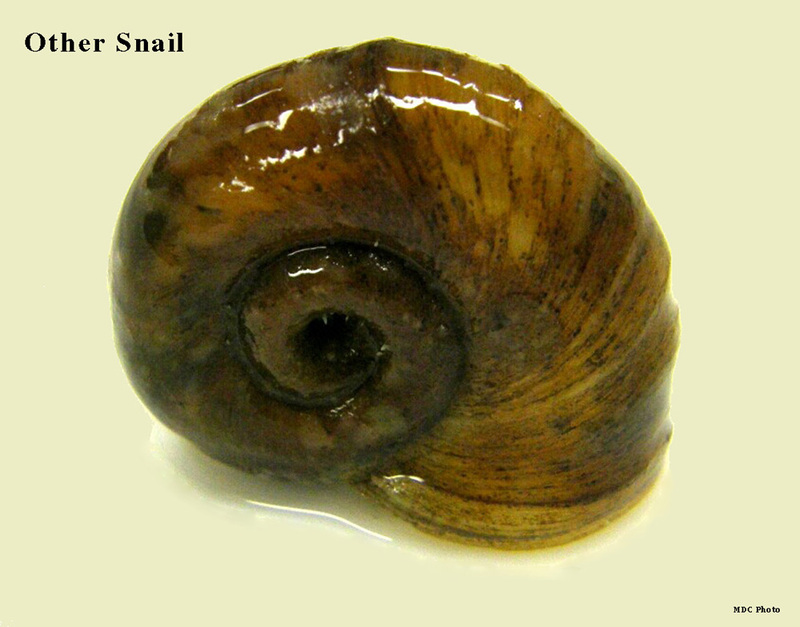 Other snails do not have an operculum covering the shell opening, breath air, and shell coils in one plane (flat).